The pleasures of all forms of mapping respond to the deeply satisfying ends to which they process ties across space for viewers, allowing them ways to access space through spatial networks that one never before had the pleasure to observe: and watching these connections and webs appear in a graphic template gives one a new sense of imagining travel across space, but also an almost innate pleasure of seeing how places are tied. 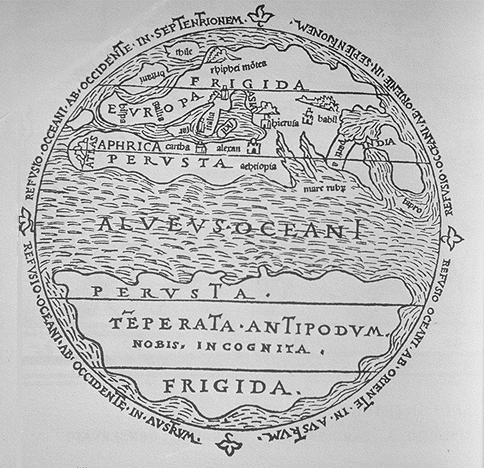 The multiple frogleaps between shores and across countries in the above world map suggests a shifting notion of the inhabited world. 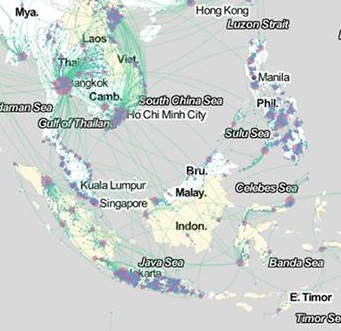 With Facebook at its tenth anniversary, the immense amount of data that the social network generates offers opportunities to map impressive patterns of interconnectedness which shift attention from those borders which have long defined nation-states or indeed the bounds between land and sea. 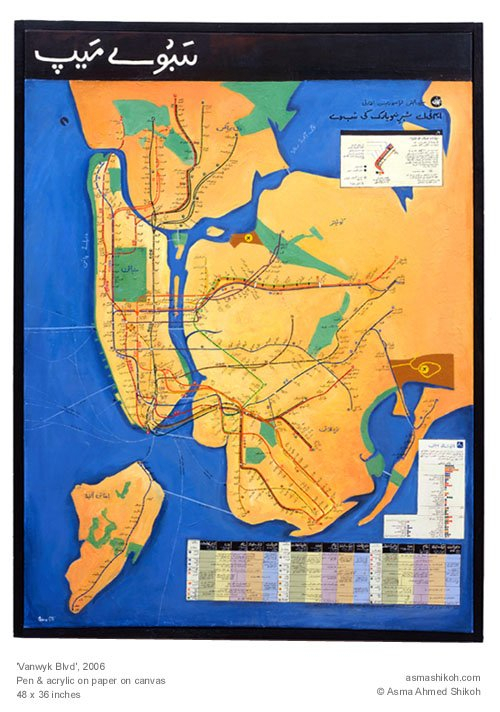 In ways that might well be signs of the times, and surely aim to chart a sort of post-modernity, the maps of connected identities offer striking ways to see the world less in terms of its divisions than the links web-based communication allows one to harvest. Indeed, without depending on the nation as the unit of meaning: Facebook’s project of comprehensive social graphing has maps populations and social networking by tracking a combination of individuals and aggregates over space–at least, across self-reported locations. Facebook has already showcased its data as a means to map friendships in ways that suggest a new way of reporting linkages in the very sort of social networks it promotes. 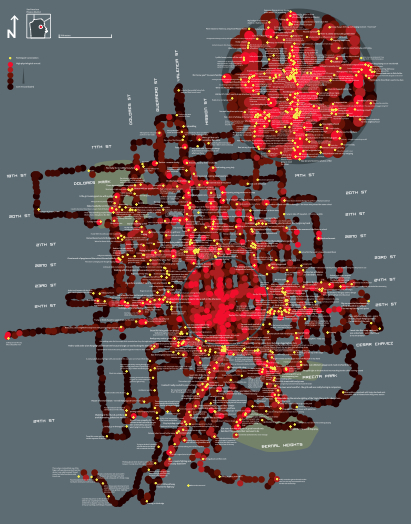 If all maps map human knowledge, these data maps also visualize space outside of spatial constraints: but a new type of mapping emerges by tracing populations on the basis of how its users self-identify as birth cities and cities of current residence. 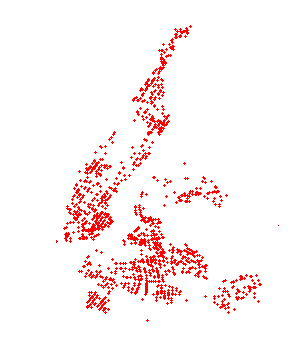 For Facebook engineers map actual spatial distributions by big data of the sort economists admire measuring, but most have found hard to discern. They are worth attending to in some detail, not only to ask about the data on which they are based, but to examine the beauty of their construction. By charting patters so compelling, they also force one to wonder whether the real story they tells go beyond the reach of the world-wide web–and what ways to best understand the geographical connectedness they actually reveal. Perhaps we can begin by asking what sort of vertiginous views they offer of the world and its inhabitants, and how we can best relate to the stunning images that Facebook engineers seem to have taken such pleasure to produce–and whose visual economy seems so pleasurable to view. After a decade of storing Facebook-generated data in a thick dossier of computer files, Facebook claims the ability for a sort of aggregate mapping, but one that erases individual stories: its aggregates conceal the somewhat obvious fact that it tracks the self-selected members of Facebook users, and showcases them as if they offered a comprehensive enough record of the inhabited world to base a definitive social graph of global populations. Perhaps Facebook users are the population that we want to notice, or the population that it makes sense to track–but this limitation of data is a liability as much as a strength–and because it treats the usual boundaries that have long offered practical constraints to travel and exchange as superseded, aside from the unstated boundary lines that divide China or North Korea from the other countries of the East. 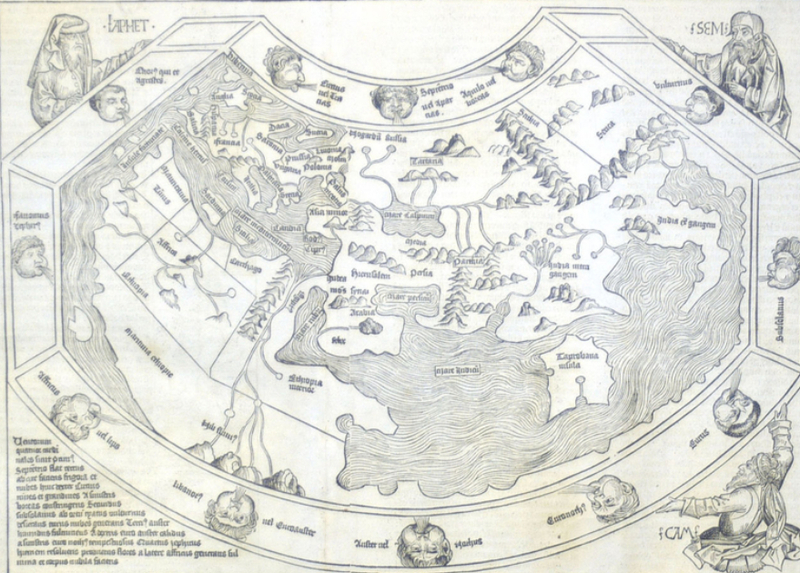 The map suggests a new sort of human knowledge of connectivity and of the different sorts of markets, presumably, that those who are web-connected participate and are attracted by or move within. The map that results is striking both because of its erasures of the border-lines and boundaries–and maps webs and arcs of population links without clear reference to spatial directionality. The skein of ties that emerges has become somewhat iconic, and has also provided a sort of template or inspiration for the map of users’ “migrations” or shifting geographic locations in ways considered below. Given the intentional elision of individual story-lines that is characteristic of the data being harvested, it’s important to try to untangle the maps it makes from the data on which they are based–if only to understand the bias of the picture they present: a demographic restricted to their users, as well as based on data that is self-reported and without any objective control. Rather than tracing the unidirectional movement associated with moments of migration driven by famine, slavery, war or ethnic tensions, the strikingly geometric maps Facebook engineers created reveal patterns of connectedness of special interest in tracking geographic mobility, but also in mapping (and perhaps describing) the new patterns of interconnectedness Facebook engineers would probably like to associate with the Facebook networking site. 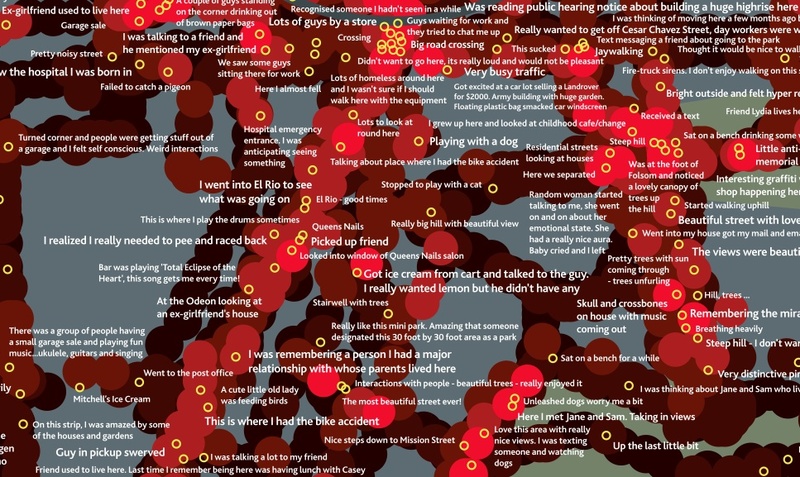 The oddness of using the self-generated information on a site of social networking as demographic data may reveal a thirst for processing big data; once invested with the aura of objectivity, the collective patterns it reveals can erase individual stories as much as synthesize completely credible and coherent narratives.Connectedness is fascinating to track. And such information like place of birth and city of residence are not considered categories massaged for personal advancement. But the internet offers enough screens of concealment and opportunities for disguise that the social graphs Facebook makes tend not only to lack objectivity, but base themselves on data pontentially massaged by users–who, living in the suburbs of one city or in a nearby village, may report themselves as living in the best-known largest nearby city readily recognized, less in an act of deception, but in ways mistakenly treated as objective in character. If all maps tell stories in how they embody meaning, the stories that the maps based on Facebook data suggests demand unpacking, if only since their numbers are so apparently comprehensive and large, as well as the stories that they submerge. One story they promote, which we might not accept, promotes an increasingly inter-connected world; others that it conceals is the specific stories about who is connected to whom and why. With almost half of Facebook users identifying two hundred friends, the webs created by the data purely of Facebook connections reveals an inter-connectivity that privileges the densest distribution of populations in North America and a broad sense of Europe, with a particularly active groups of users also dispersed in Central America, Peru, Argentina, Anatolia (Turkey), Nigeria, South Africa, Pakistan and India, and Indonesia. This map of global “friendships,” developed by Facebook intern Paul Butler in 2011, offers a “social graph” of some 500 million people, linking users’ friendships to actual coordinates of latitude and longitude to create a visualization in a sort of media mash-up, illuminated by an intense if other-worldly backlit glow of FB blue. The map of social networking that results suggests not only who is networked, rather than density of habitation but of course also maps the density of the culture of social networking that has come to stand, especially for Facebook, as a sort of index of modernization. The equality between Facebook use and modernity recalls how closely the ‘Twitterverse’ maps onto the maps onto the global flight-paths of airline routes, as new study has found, suggesting that airline connections between cities provide a statistically valid proxy for twittering to sites beyond one’s own hometown–and the ties that Twitter makes in virtual terms should not be in any way that distinct, after all, since “Twitter is part of the real world” as is the internet, as Matthew Battles astutely observed, and tweeting is shaped by real-world social ties, even if it offers a new media for communication. But it would seem a misleading inversion of cause and effect to take tweeting as an out-and-out proxy for modernization, equating it with the tracing of ties commerce and capital flows. The question is not about the data of Twitter vs. Facebook, but about how big data is used to create the multitude of variant maps generated by Facebook media, including this map of ties among its users. The multitude of variant maps generated by Facebook media seem particularly striking for their post-modernity in how they elide or ignore the frontier as a primary unit of meaning in world maps. 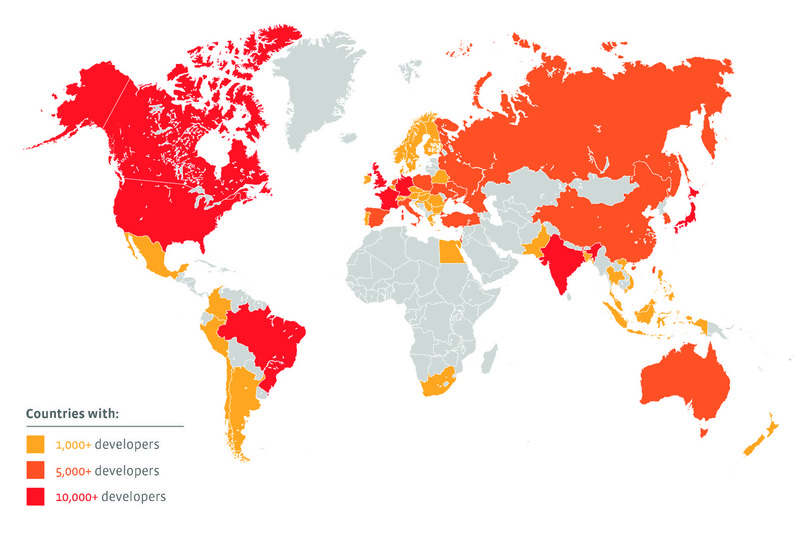 Is this map an illustration of of the acceptance of Facebook as a part of one’s identity, and do the great arcs themselves constitute something of an accurate index or emblem of post-modernity? While Facebook is actively interested in promoting is own ability for harvesting data, many of the maps of friendship, migration, and social ties of course read a lot like images of its ability to promote social networking. The arcs of light that map online ties not only mirror the sort of etherial airline map that seems as good a predictor of twitter ties–does this suggest the similar likelihood of access to airplanes as access to tweeting?–but a gauzy penumbra spun around the earth’s inhabitants who sit spellbound before backlit screens, luxuriating in the proxy embrace of on-line connections and affections? 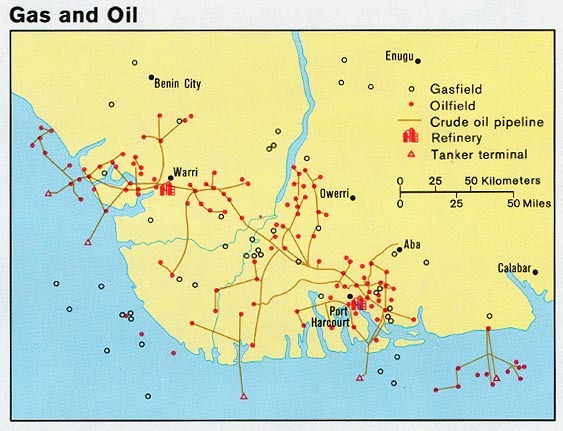 It’s always important to ask what sorts of abstractions that any map seeks to communicate through the tenuous bonds they draw linking actual regions. Is this a new story the habitation of the select areas of the information-sharing world that Facebook links? The above image tells one story about the inhabitants of the world, or rather of a specific world, and a strikingly suggestive one in how Facebook’s data defines the worlds inhabitants as its users. For there is no doubt a certain amount of estrangement from other forms of communication that this image, linking pairs of cities weighted for how many friendships exist between them, also maps, varying the intensity and brightness of lines’ coloring by the number of friendships shared as a way of mapping “real human relationships” across space in ways that Facebook does not note explicitly: the map devised by Facebook’s infrastructural engineering team is a map of the very distances that Facebook as a medium is best able to bridge. If perhaps just as revealing of access to computers, digital literacy, and wealth, the arc drawn across the empty spaces of deep blue that are oceans charts the networks of inter-connectivity among which news travels, memes grow, personalized photos shared, and a sort of quasi-information society exists, by the construction of the social network on which it travels. This “globology” reflects less the currents of cultural contact, migration, and exchange that define global history, but something analogous to the cartographical flattening of it, viewed through access to the options of like, connect, dislike, or share that Facebook offers its users. 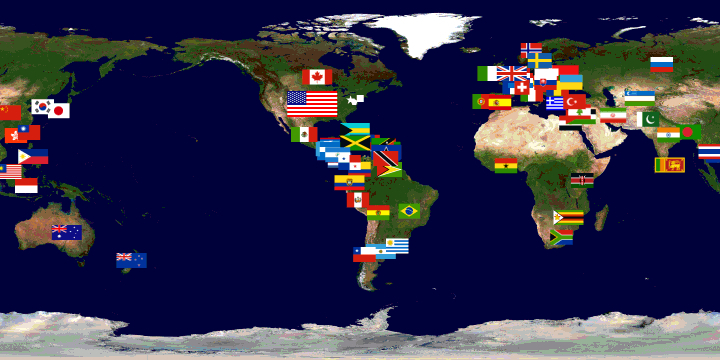 It charts the options that have shaped, to one extent or another, a transnational psychology of communication. Which makes the ambitions of Facebook engineers to map patterns of “coordinated migration” an interesting case in mining of new trends in geographic mobility from the massive amounts of data that they collect, if only because of its goals to map actual spatial position over time. 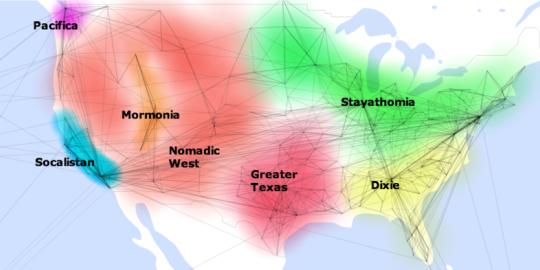 The somewhat-recent maps of what FB term “coordinated migration,” based on the patterns of relocation that emerge from self-reported data of the site of birth and current location of FB users. The result of the database’s collation is to track and define the lines of the global phenomenon of urban migration, once reserved for larger industrial cities or metropoles, but not significantly broadened across the world, both to population growth and a drying up rural prospects and jobs in the magnets of urban metropoles. The idealized format of these arcs of migration create a social scientific aura of explanatory simplicity, and serve to affirm the notion that individual itineraries respond to an economic marketplace. The boast of Facebook to chart such pathways with accuracy has been critiqued for its use of private data without evaluation through the scrutiny by peer review, and may deviate from standards of impartially objectively derived data, or by using publicly listed self-identification to endow with the graphic objectivity (or appearance of it) on a map. The maps make tacit claim to reveal the real attraction of populations both from neighboring cities in the same country, or, in South East Asia and India, from neighboring countries, by the web of tiny green arcs discussed in greater detail below, provide a useful filter for sort of big data economists have problems measuring of global migration, and indeed to distinguish quantifiable migration numbers and patterns in different regions of the world. Once again, frontiers are less significant than the ties of cities that the data input by Facebook users enter into their pages, and which they map. Underlying questions remain, but seem to be waiting for further or future analysis. 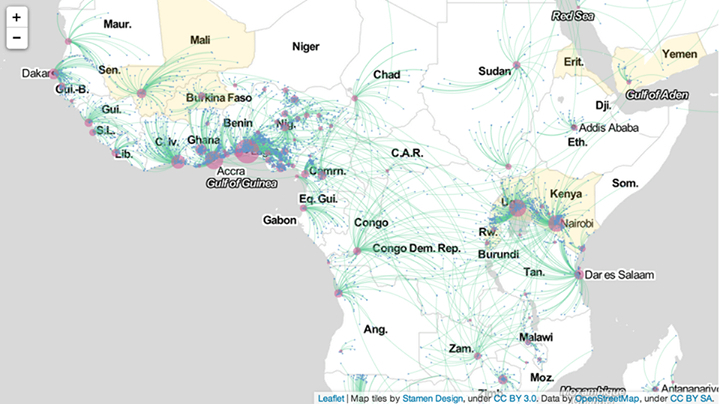 For one, how, Sheryl Sandberg, do these patterns of migration map out along gender lines? In mapping “destination cities” by red dots, and “origin cities” by blue, the design group Stamen has helped render a smooth arcs of migration as a set of naturalized movements, in order to throw into relief the relative density of a phenomenon of “coordinated migration” around the world, but creates a naturalized web. They give one useful key to read meaning from these idealized arcs by setting them against a global map coloring regions of relative urban growth in 2000-12 pale yellow, in the sort of compelling image compressing a density of variables to simple graphic forms of which Tufte would be proud: routes replace cities that they link, or that appear as numinous purple blurs that remind us of the messiness of mobility; the crossing of frontiers replaces frontiers, which must be deciphered by the limited role of crossings from China, whose very existence is only implied by paths of emigrants abroad. 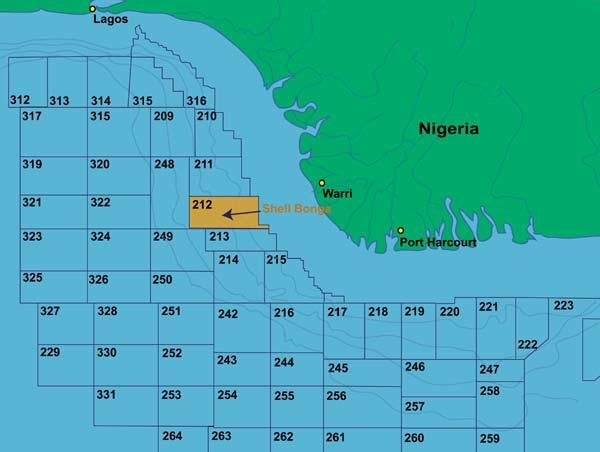 The mottled blotches of blotting-paper blue to which the thickest green trails lead indicate the fastest growing markets of production that provide the magnets from nearby countries as well as for regional residents. 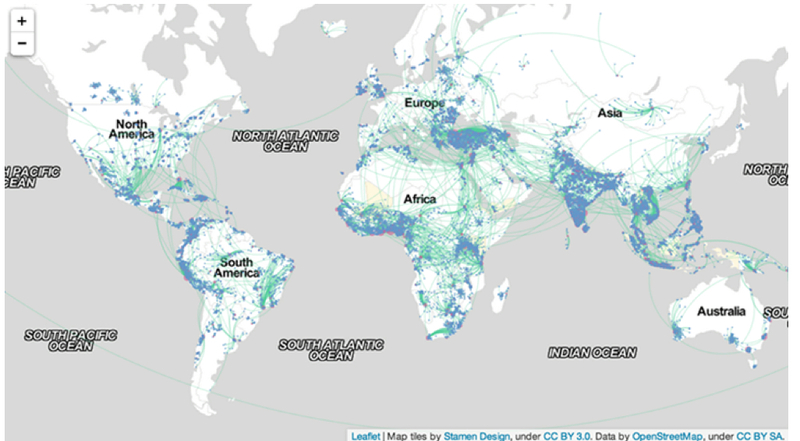 The linking that the map tracks suggests a sense of populations in flux, and of the market-driven nature of the migrations that Facebook’s data tracks, and whose intense mobility is a sign of relative modernization as much as social unrest. The broader linkages such data implies between Facebook and the global process of modernization is, certainly, good publicity, no doubt, if largely on the level of a subconscious association. But the emergence of what Facebook has christened in quasi-sociological jargon as “destination cities” might be taken with a grain of salt. But the data that Facebook has so far collected is also an inversion of a somewhat embarrassing incident that occurred at Facebook back in 2010, when Pete Warden devised with the inventive project to scrape the public Facebook profiles of 210 million users in the United States to derive the clustering of networks that divided the country according to FB ties, creating his own national map, but then withdrawing the offering of the data as public when Facebook threatened suit, but had to allow him to keep up the map he derived from the data–brilliant if only for its definition of clusters that would never be rendered in a printed map, with eponymous if imagined toponyms as Socialistan, Mormonia or winning ones like Stayathomia, designating the greater northeast and midwest–a region viewed by most as revealing less geographic mobility, but which wouldn’t appreciate that name. But the huge amount of data that Facebook has developed in a decade-long harvest is hard not to want to map, if only to see what sort of visualizations it produces. And the three or four maps they issued tracking the benefits of ten years of social networking have led to the claim to reveal new patterns of social migration to cities or urban metropoles that are the equivalents of hot-spots in a globalized world. The shading yellow of regions the World Bank found marked by high “urbanization growth” over the same period–2000 to 2012–creates a simple context to situate the migration, although it would only really make sense to chart that growth in population over a broader period corresponding pressures that impacted those who were migrating in ways tracked during this period as a way of registering, or so Facebook would like us to think, some of the primary forces that have reconfigured a globalized world on which Facebook has a clear take. The cities noted as cross-national destinations reveals a sense of global mobility and inter-connectedness with which Facebook wants to promote, to be sure, linking a sense of globalism with its product’s global reach, but wrap the world in a skein of green lines link with differing intensity selective cities an towns, suddenly giving prominence to the links of a potentially economically prominent demographic. The elegantly arcs of migration charted from original residences are quite impressive localized illustrations of geographical mobility: if the result might not be truly comparable to how Aude Hofleitner, Ta Virot Chiraphadhanakul and Bogdan State have decided to evoke the many “large-scale migrations [that] are an important part of human history,” the chart reveals micro-patterns of geographic mobility by neat green lines would make a social historian turn green with envy, mapping “flows” from hometowns to current cities. The responsible social historian would ask whether those nice curved swirls map along a symmetry misleading in portraying actual paths that those migrations took–many, one could speculate, were routed through multiple other cities or post-modern metropoles, as the line connecting any two points anywhere is rarely a perfectly smooth trajectory or arc: the visualization betrays, in this sense, the data-centered models from which they derive, and are, in a sense, less revealing of a picture of actual populations. 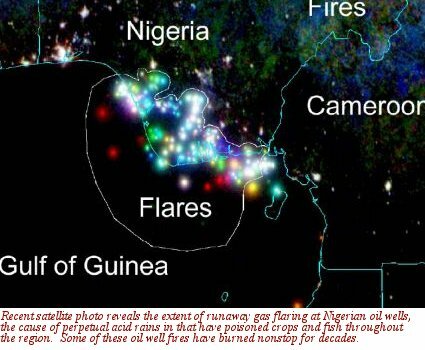 But the floral patterns they create, spinning from blue-dots of geographic origins to red dots of final destination or current habitation, document a fairly radical shift toward urban in-migration, reminiscent of nineteenth-century Europe, and a huge attraction to sites in coastal west Africa, not only Lagos, whose urban population’s growth by almost one-fifth reflecting the expansion of the city and oil-production, but also Dakar, Accra–whose urban growth also approached 20%–, Ghana, the Gulf of Guinea, and Nairobi, as well as Dar es Salaam. (One suspects that this is but a shadow of the true migration of populations, since it only represents data from the social network that Facebook runs, and is silent about its very selective picture of folks with internet access and net-literacy.) 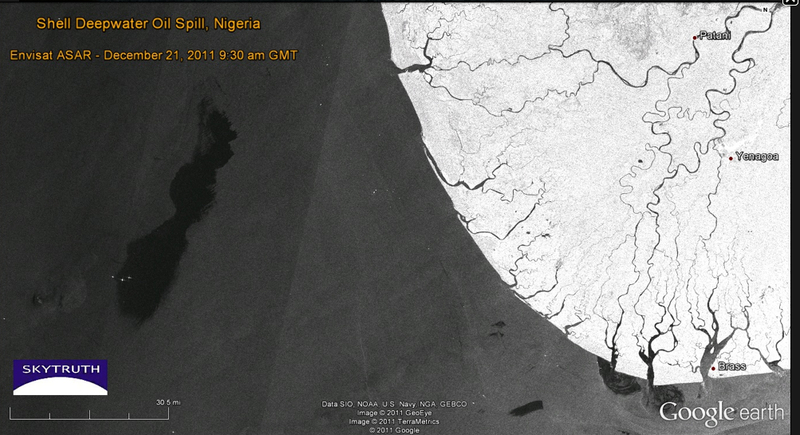 But the migration of Nigerians it tracks to Lagos is nonetheless prominent. Could this data not be usefully cross-mapped with the growth or social compositions of destination cities in more provocative ways? What sort of visualization would that create? Can it be refined, by accessing data like the changed place of Facebook users over time, creating a somewhat more messy, but perhaps more informative, way of tracing patterns of migration, than a graphic that seeks to underscore as well as illustrate the notion of a “coordinated migration” from smaller towns to metropoles? 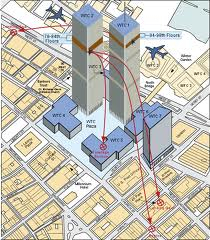 To be sure, the arcs used to denote the alleged concentration of migration area a way of softening the image of Facebook’s data, making it more organic part of the map, and not serve as an apparatus of any accuracy. The arcs are aesthetically engaging as a way to illustrate each “destination city” by its reach to its hinterland–or to other cities of origin–to visualize and showcase the massive amounts of data that it has collected, much in the way that Facebook has engaged in multiple ways to visualize the scope and extent of data that it generates over a huge expanse of the world, if not to suggest it forms a way of tracking the inhabited world, under the name of Data Science, always keeping that data anonymous. The map of major destinations of folks in the two year period of 2010-12 is striking for how it reveals a changing face of global socio-professional mobility that seems specific to some classes. The usage of circle arcs in the streamlined OSM cartographical data is almost as misleading as it gets if one thinks that the arcs mirror the messiness of routes of actual spatial migration. But the abstraction of defined population currents offers an abstraction of presumably “eminently hirable” individuals looking for more profitable lines of work, linking the Facebook populations with the up and coming professionals of the future, as much as with job mobility. The yellow highlighted areas of notable urban population growth create a backdrop that increased the legibility of this slightly restricted map, and others below–one wishes for a bit deeper patterns of urbanization and rural pressures–at times far preceding the decade we are describing in these maps. The graphics are particularly striking visually, and effective as compelling images of global patterns, even if they also might not be that deeply informative: they trace a collective social history of urban in-migration in Istanbul, the city Facebook’s researchers found to have the greatest “coordinated migration,” largely as it is the greatest metropole in a largely rural but rapidly “westernizing” country whose infrastructure has greatly transformed–as if Facebook use was a predictable index of economic modernity and, by extension, growing markets for its advertisers. The foci Facebook’s data has illuminated here indicates as “growth towns” such destinations as Nairobi, Lagos, Port Harcourt, Accra, Kumasi, Kampala, and Dar es Salaam, but purged of the living conditions in those sites. 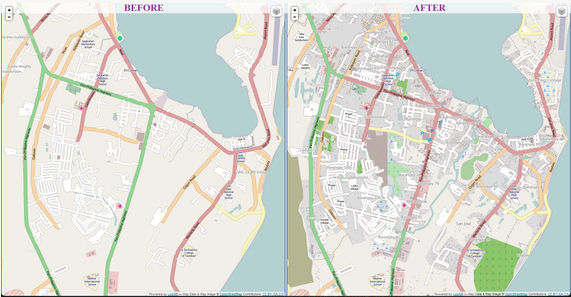 The transformation that these maps chart might be one of the huge expansion of internet users–the maps map their own data, after all. The clustering of such users in a rapidly growing city like Istanbul is particularly compelling, and interesting reveals the huge amount of in-migration from the less sparsely populated areas of Anatolia around the Black Sea that led to the city’s growth by almost 12% in 2010-12. It would especially profit from a charting to areas of the city–if possible–or the expansion of the city itself, as well as the growth of other Turkish cities from which those arriving in Istanbul hail: are these towns declining, and just dying, or are they also growing at a comparable rate? Do folks moving to Istanbul list actual home-towns, or the nearest large villages? Istanbul is perhaps also unique in being a modern metropole drawing educated populations from many nearby Macedonia, Bosnia, Bulgaria, Albania and Hungary, as well, it seems, the Ukraine–in a sense of the rebirth of the Ottoman Empire, but in ways distinctively lopsided to the East: a blanket of green gauze of strings of differing intensity whose arcs blankets the northern regions of Anatolia bordering on the Black Sea. The simplified elegant light green arcs in the above map and its above counterparts stand in quite sharp contrast to the rapid circulation of populations mapped in what is by far the densest and in senses most complex map groups India, South-East Asia (Thailand, Cambodia, Vietnam, Philippines, Singapore, and Malaysia)–almost a data-overload itself–or of the specific stories of these immigrants. Of course, the question of why this region–embracing really at least three, but probably four sub-regions, should be seen as a collective is not clear, but it is essentially “the rest of the world” aside from the main regions Facebook has parsed. 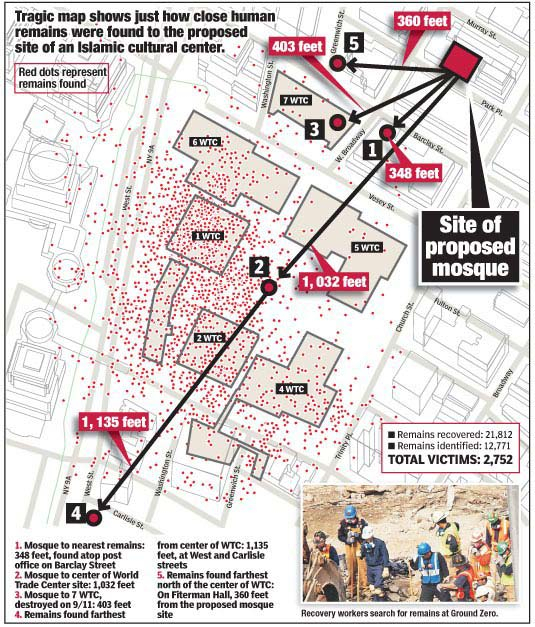 The graphic suggests a far more massive amount of mobility that is almost difficult to distill to a single image or map. (China is absent from the dataset, because internet use is so less common; public self-identification is also no doubt far more rare, and foreign, anyways.) There was quite explosive growth in this period in Bangkok (significantly over 10%), Hyderabad (a bit under 15%, or 14.4%), and Chennai (also slightly under 15%, or 14.4%); one wonders more about the social demographics that motivated this growth, and how much of it maps onto the Facebook users who it maps. The loss of the stories of individuals who are immigrating to cities is almost part of the point of these maps: there is no story that needs to be told about this immigration, because it is a process of migration that responds to uniform global pressures we all recognize, which are specific to the demographic of Facebook’s users. This sense of a story is far from Satyajit Rays’s vision of “The Big City” of the immigration of rural villagers to their new life of searching for commercial employment in the banks, mechanical sales, and lawyers electrified Calcutta. For the migration to the city that dominates each regional state–rather, the data charts the growth of emerging metropoles as Chennai, in southern India: it charts mobility from cities to cities, inter-city mobility, among a I-think-that-I’m-probably-quite-employable demographic of relatively educated Facebook users who are most often online, and would coincidentally provide a selective demographic for advertisers to reach. Indeed, large swaths of rural territories are essentially unmapped, save by the intersecting bright green arcs that cross over their terrain, as if without Facebook users, they did not deserve to be mapped–or, at least, without necessary data, fall out of it–as if to locate the intensity of migrations around its rim, although quite a few sole threads of migration originate from its empty interior. The image of a growing South Asia is, however, particularly interesting for the number of itineraries it traces out of China, migrating to Taiwan and Hong Kong for the most part, as well as South Korea and the Philippines; the active clustering of Facebook users along the coast suggests that it is were the true action is occurs, as if to rewrite the attention usually paid to charting China’s escalating economic growth. The vibrancy of ties across borders (and across seas) is striking, as a certain demographic seems irresistibly drawn by Taiwan, and others to Thailand (Bangkok) or Cambodia and Vietnam, whose arcs reveal notably dense ties of geographic mobility. Whose stories is revealed in this amazingly dense map of neat green arcs, which, if they simplify the messiness of the individual stories they collectively track, seem intended to create a sense of a coherent network of meaning that might not be present in the area’s economy but is actually extra-national in nature: these migrations seem links of like to like, and of educated to industry. One however wishes for greater resolution in an image such as the above: what is going on in the Philippines, for example, where Manila is not so much the central hub one might expect, but that each island seems to have its own centers of aggregation and congregation, is unclear; out- and in-migration also seems mixed, as it does around Djakarta and to an extent in southern India and Sri Lanka. Would a close up, say, of Polynesia or at least of the area around Singapore be of help in discerning what patterns of “coordinated migration” might emerge? The huge urbanization of Java, Bali, Indonesia, Laos and Vietnam, and the circulation in populations in the rapidly growing region, as well as any other political and economic pressures on this sea of population shifts. Many of the arrivals in Bangkok are from within Thailand, moreover, rather than from other countries, suggesting a very traditional pattern of migration within linguistic and cultural units, rather than the global circulation that such maps might be expected to chart, or might at first glance appear; similar interior migrations characterize Vietnam and, it seems, the Philippines, where much migration even appears specific to each island. How, to use a metric that Facebook has cleverly adopted in its map of friendships across nations, can one view these ties through the lens of shared languages or linguistic similarities? The patterns provide a new way of reading ties within the map that trump, or erase, geographic proximity, in ways that seem of interest in tracking, for example, the shifts of economical mobility that might be tied or associated with NAFTA. 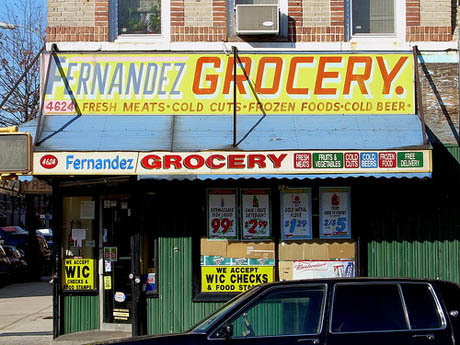 What is one to make of the far lesser webs of connection or migration in the North America, where there seems, save for the Cubans who have arrived in Miami, far less social mobility or a zero-sum game? 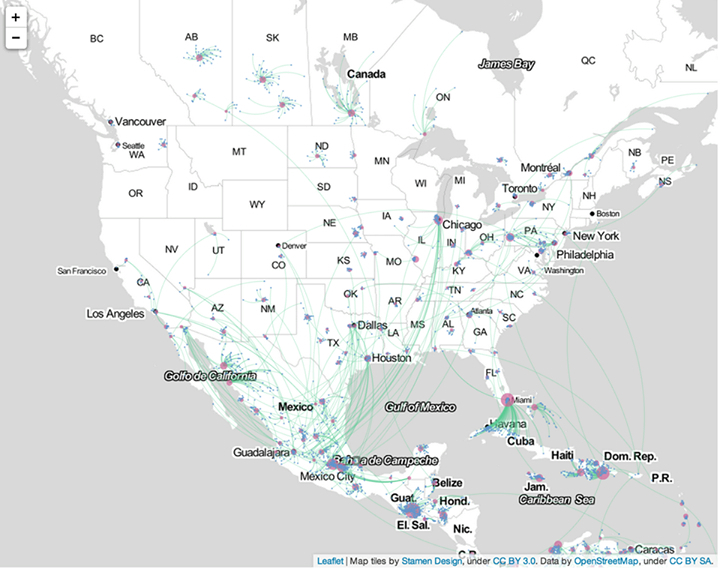 Facebook works–and thinks–in coordinated networks in this case, and finds little similar coordinated migration within North American cities; even in the international migrations from Mexico and Cuba, which seem to be potentially overstated–they reflect the number of Cubans in Miami that state their origin as Havana or Cuba; one can detect less of a coordinated action than a mass movement, in the case of migration from Mexico, than what might be of a phenomenon chain migration, rather than one independently coordinated, and determined more by family links than economic need. Three different patterns of migration seem to be evident in the three countries shown below–even though the Stamen projection seems to erase national boundaries or borders by rendering them as equivalent to regions or states: Canadian cities draw amost exclusively from the surrounding province, unlike most of the US, save North Dakota and New Mexico; Mexico shows active cross-national migration patterns, perhaps based on familial ties, the engineers note, to such major destination cities as Chicago, Houston, Dallas, and Los Angeles. So do the above mapped elegantly detailed distributions, given the selective nature of their self-reported data, mean anything definite at all? The skein of green lines of differing intensities wrap the world in a variety of ways that contrast, for a start, with a simple map of flight paths: what remains untold, however, is exactly what demographic the Facebook family has been able to attract. It is hard to say what they mean exactly, as a result, or how much they provide indices of mass migrations, even though this quite valuable data should by no means be dismissed. Since it depends on self-reporting of information, they capture a small number of the actual migrations that occur between countries, by migrants who are less likely to log their travels in internet profiles or lists of friends, but the data that the engine of Facebook has, ten years into its existence, managed to compile, and is now eager to show the world that they are able to track. 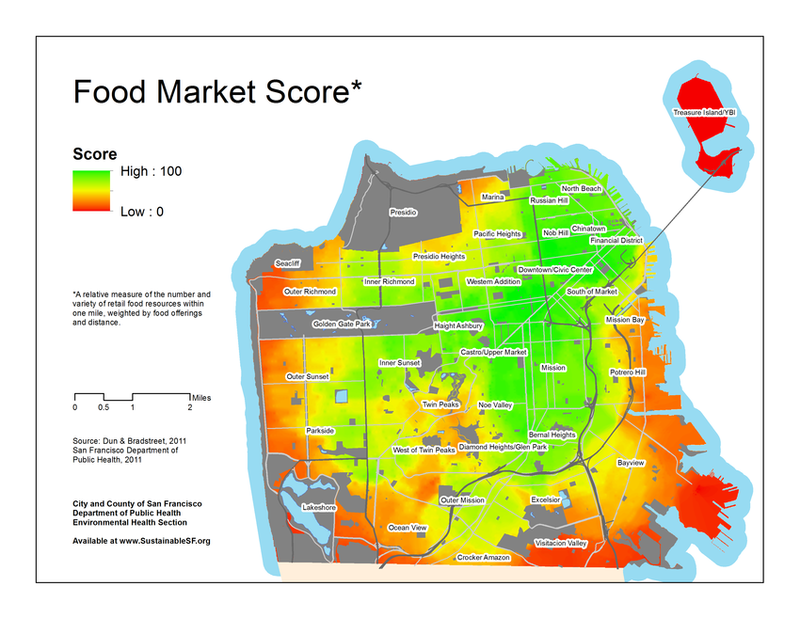 Of course, the data is only data–and it’s of interest to create a map of data, if only to see what results. And the somewhat over-determined data of who uses Facebook–folks who are geographically removed from their loved ones?–may be difficult to map as a trend. It provides a compelling collective visualization among folks who belong to that demographic that often reveals the persistent meaning of the local and regional in a so-called globalized world. Perhaps it doesn’t really map a world that is less rooted in geography–Google, after all, generates the GDP of a small country in itself, after all–and where place isn’t supposed to be so great a determining factor or constraint in most markets and lines of work. The question is what such trends of migration–if that is what’s being charted–mean, and what corner they raise on a map of larger trends of relocation. 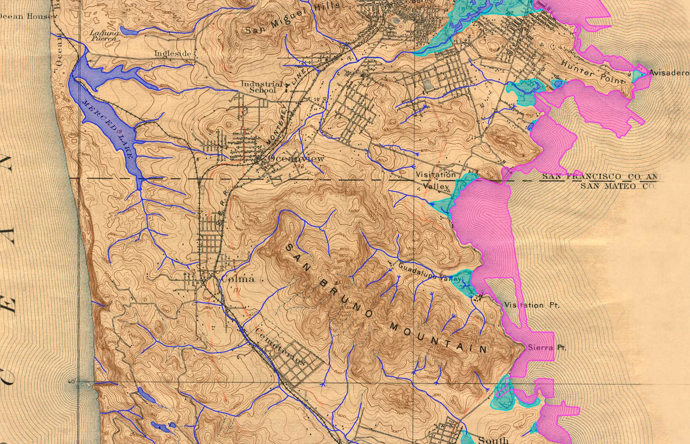 Since maps invite their viewers to enter an image of the natural world, as well as to relate places to the broader geographic context in which it lies, they offer increasingly useful perspectives to relate the ocean to the land. 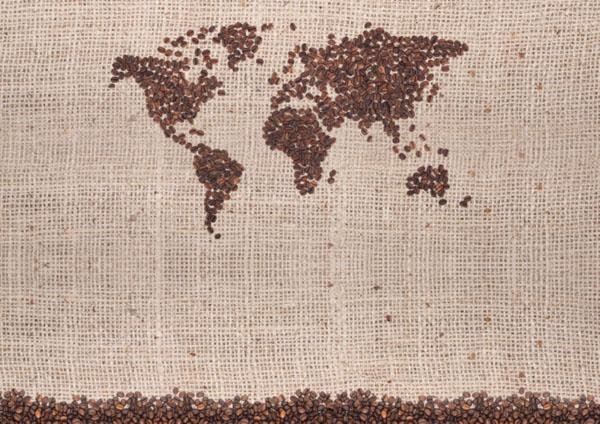 The perspective they offer on all regions has long been rooted on the land, however. And the coasts–and indeed the dangers–for adhering to such a “landlubberly perspective” on our rising oceans are increasingly apparent. 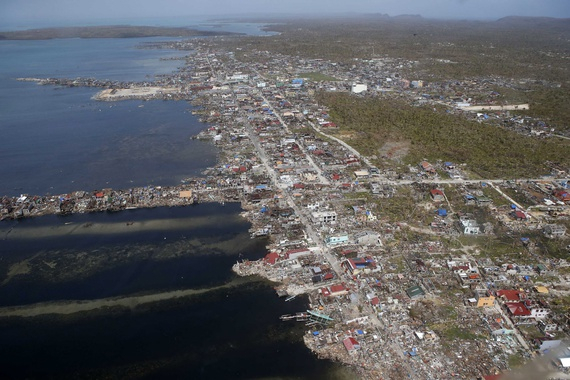 A perspective that privileges mapping inhabited lands –and orienting viewers to a set notion of place–places us at a particularly disastrous disadvantage when assessing questions of climate change, or reacting to the increasingly lethal storms, tsunami, and typhoons encountered as the inevitable consequences of climate change, and that coastal cities–from New Orleans to New York to the devastated Philippine coastal cities of Tacloban, Ormac or Baybay–seem condemned to repeat. In continuing to rely on maps whose perspective denies that of the future expansion of oceanic seas, we threaten to lose perspective on our changing relation to the sea. We have long found threats of the invasion of ocean waters difficult to integrate in an inherited image of the city as a bounded entity, and continue to draw clear lines around the cities in which we dwell: our maps draw clear lines between land and water. Perhaps this is because waters seem so difficult to circumscribe or bound, and the fluid relation between land and water difficult to render accurately or draw. When an influential movement of urban architecture and planning calls for a greater integration of the natural world–so often bound outside of cities or city walls–within urban entities, they retain the notion of the bounded city. Recuperating the term the entomologist and biologist E.O. Wilson coined, “biophilia,” to express the “innately emotional affiliation of human beings to other living organisms” in human nature that demanded attention, they argue that cities need to promote contact with nature, since, Wilson argued, such contact provides a spur to creativity, productivity, and well-being. The planning of “biophilic cities” is dedicated as a movement of urban design to “contain abundant nature” in their structure. The championing of “model cities”–such as Perth or Singapore–are promoted as examples of the “biophilic” age of urban architecture. Yet are these models (often located in semi-tropical climates) not limit cases where we can most easily integrate oceanic waters into a built environment? For by isolating the city as a unit in which to restore nature, there seems more than a bit of bio-fetishism in singling out new spaces where blue waters can enter an urban environment: the optimism of its evangelical tenor as a movement of urban planners, dedicated to reframing the reintegration of cities with the watery surroundings has gained a broad charge and dedicated following, including partner cities that border on water such as San Francisco, Portland, Milwaukee, Vitoria Gastiez (Spain), Birmingham (England), and Wellington (New Zealand). While the benefits of such urban architecture appear considerable, the challenges for expanding the role of the ocean in the horizons of city-dwellers seem only the start of restoring the historical isolation of the city from watery life, or integrating the oceans within our future urban planning. The movement of blue urbanism is an illustration of courageous dedication to a project of reintegrating aquatic and urban environments–at least, presumably, before the shores of cities will be redrawn by ocean waters. 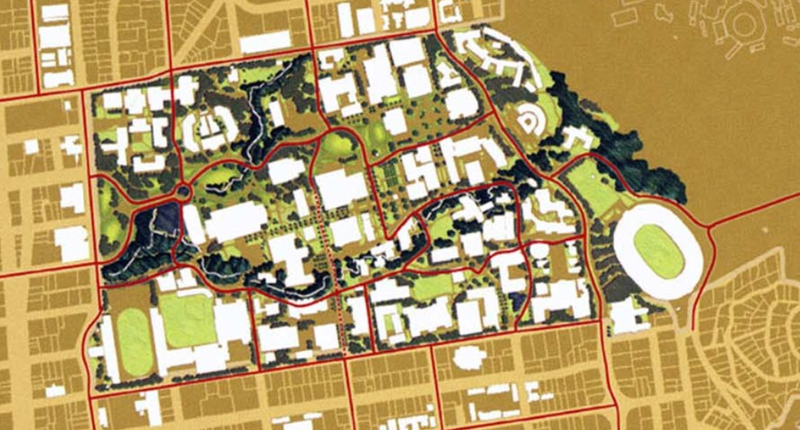 The considerable cognitive benefits claimed for these more enriched urban networks build on movements for integrating networks of urban “green-spaces”–including not only parks but green-belts and even forests is a reasoned reaction to urban sprawl and overbuilding and way to take charge of the built environments we create. “Blue urbanism” would comprehend a watery frontier, offering opportunities for immersing children in rivers, urban parks, watery excursions, and underwater ambients which surround cities. 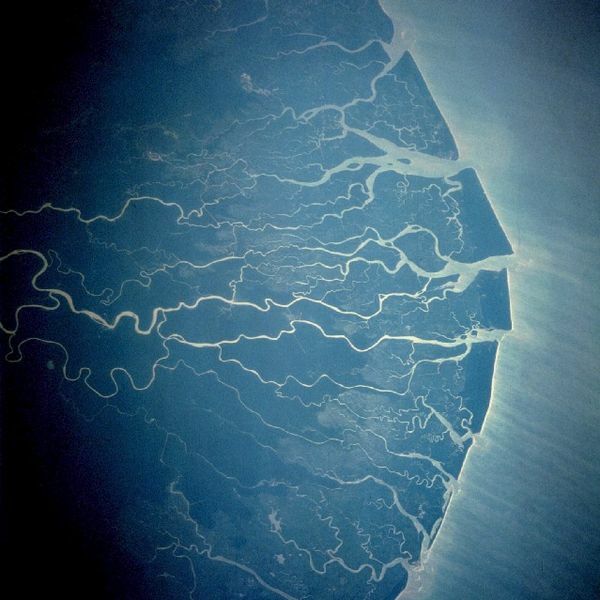 Blue urbanists espouses an improved integration among the fauna and flora lying near aand around cities within something like a green belt–and espouse the value of an analogous “blue belt” as a way to foster a new attachment to the waters and their shores, rather than seeing them as limits of built city. Yet does emphasis on the human benefits of such contact carry a all too narrowly restricted notion of what a watery surrounding might be? The watery oceanic borders of cities are in themselves rarely mapped, though the shifting waters of the Gulf Stream and other currents determine the shoreline inhabitants of North America, but might a map provide a fuller perspective on the interchanges and ecosystems lost by drawing firm barriers between urban and ocean life? 1. The “blue urbanism” that Timothy Beatley advocates wields the rhetoric and best practices of green architecture’s “integrated network of urban space” to invite us to re-imagine cities’ relation to the shores on which they border. Yet there is concern that such projects of rebuilding turn away from the depth of our historical remove from the waters that surround our cities–an increasingly pragmatic concern after the very fragility of this divide has been so traumatically revealed in recent decades, from damages inflicted on US cities by Hurricanes Katrina and Sandy or, afield, the Indian Ocean Tsunami and super-typhoon Haiyan. The ecology of biophilic design, for all its benefits, could benefit from a broader global ecology, basing itself less on the benefits of human friendship with the biosphere, and being more oriented to global contexts of the cost of climactic shifts by looking back to the geography of the past–lest the affections of biophilia border on the bio-fetishism of the philistine. The precepts of adaptation and resilience to mitigate bad policy decisions are of intense importance; historic maps offer base-lines to qualify the alienation of cities from their shores that compliment the need to build green and blue belts. The maps we have drawn about urban areas may provide a basis to recuperate the integration of life along the shorelines we have lost, in short, and the nature and settlement of life along the city’s shore–as well as the ways that oceans serve less as a barrier to than interface with the shore. While we map the trespass of waves over the finely drawn boundary lines of territories, measuring incursions across demarcated shorelines and property lines, and mourning the scope of damages and loss, we seem to remediate via maps–much as how OSM-mappers have begun to chart buildings and routes in the Philippines for delivering humanitarian supplies, as a way of rebuilding, if at first in virtual form–to restore urban infrastructures in digital form. Yet these maps do not comprehend, for lack of a better word, the sea. The terrible human costs of each of these events serve as something of an intimation of the threats global warming poses to urban environments, and invite rethinking notions of ‘planning’ replacing the imagined stability of a built frontier of urban society with a more permeable line of inter-relations, even as we come to appreciate how little conscious “planning” went into the drawing of earlier boundary lines. Both the human and material costs of these events compel an appreciation of the role of the shoreline, as well as intimations of the threats global warming poses to urban environments and indeed the world we have built. Naturalists have recently begun to realize the power of maps to invite reexamination of our relations to place, however–often by using historical maps to excavate the shifting historical relation to the natural world that have led us to draw such finely parsed lines between planned urban environments and their surrounding waters to assess the costs of these sorts of fantasies of spatial distinction: if we don’t build on the water, we cannot ignore it but at our collective peril. Map offer a particularly precise if plastic means to situate place that are able to register deeper, less easily visualized, chronological changes and global contexts, or shifts within a regional ecosystem that would be otherwise difficult to conceive. 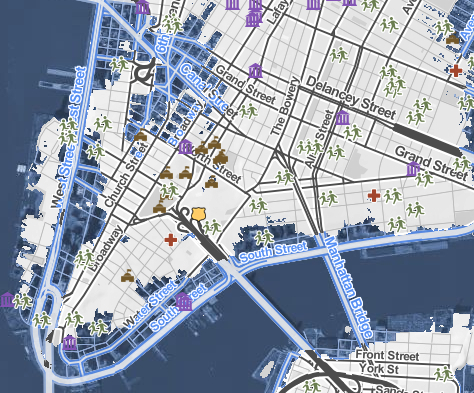 In age of rising oceans and global warming, maps draw relations between local settings and global changes to help assess the extent to which global warming threatens to obliterate or erode the stability of our concepts of place. Maps of the circulation of waters around specific cities compel us to rethink an inherited oceanic boundary. 2. Can a “blue architecture” invite us to re-imagine bifurcated schema of ordering of space to which we have reduced the relation between land and sea to a simply drawn line? Or have we lost a relation to the land that a new building project cannot recover without clearer lenses to view the relation between water and planned environment, and to be invited to appreciate a clearer register of the relations between coastal cities and the surrounding sea, and, indeed, of the delicate interdependencies that are the basis for our sense of place, and underwrite how we imagine “place” as a category? 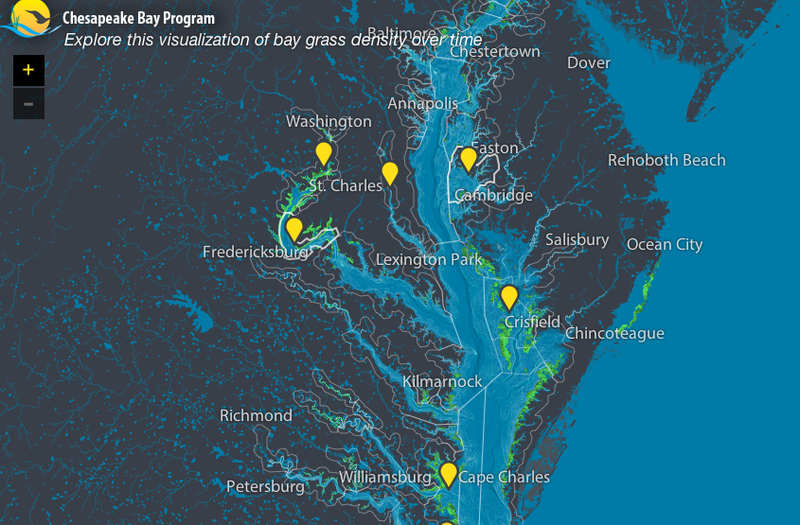 A historicized art of mapping stands to call attention to the ecosystem that might lurk beneath the threat of climactic change, and understand the changes they pose to local ecosystems. 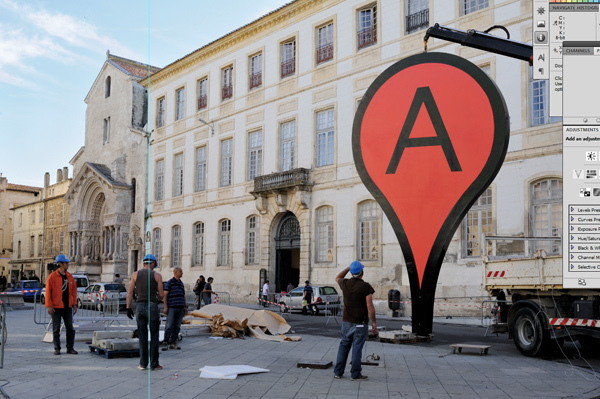 The art of mapping provides unique tools to invite viewers to consider local settlements, and develop tools to re-imagine a relation to the sea new building projects alone cannot foster. 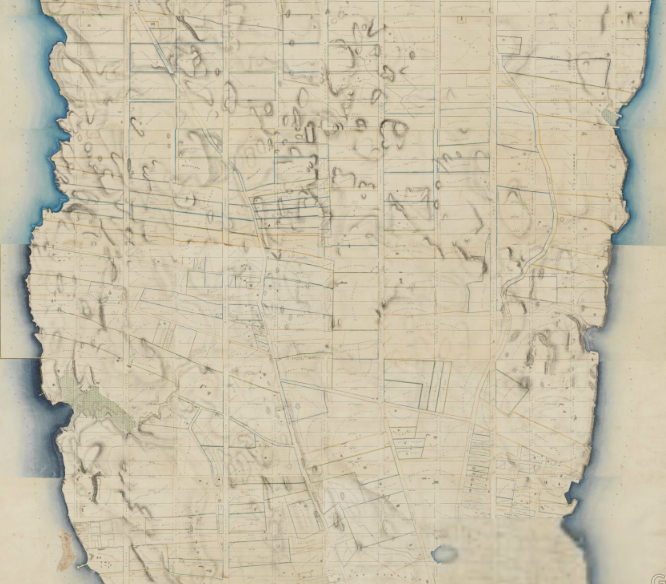 We can appreciate the huge changes wrought in a relation to the shore by how a cartographical reconstruction of Manhattan island revealed in this stunning 1782 British Headquarters map drawn at the painstaking scale of 6 1/2 inches per mile reveals the island’s coastline as it was experienced by Lenape tribespeople. Using the watercolor map as the base-map for his digital reconstruction of the local environment, landscape ecologist Eric W. Sanderson of the Wildlife Conservation Society worked over five years to create GIS database, geo-referencing landmarks and sites to reconstruct the forgotten landscape based on 200 control points. Sanderson’s completed map has a beauty that invites viewers to explore a computer generated landscape’s verdant arboreal landscape and rich wildlife, moving with amazing apparent precision over a web of lost streams, rivers, and hills that agricultural and urban development erased over time–most all of the more than 570 that distinguished the island Lenape members to give the name “Mannahatta,” the ‘island of many hills,’ and to map over 627 varieties of plants in the island, and the 233 types of birds and 24 different mammals who lived in its delicate interstices of interlaced ecosystems, in its swamps, ponds and the estuaries of its shores. 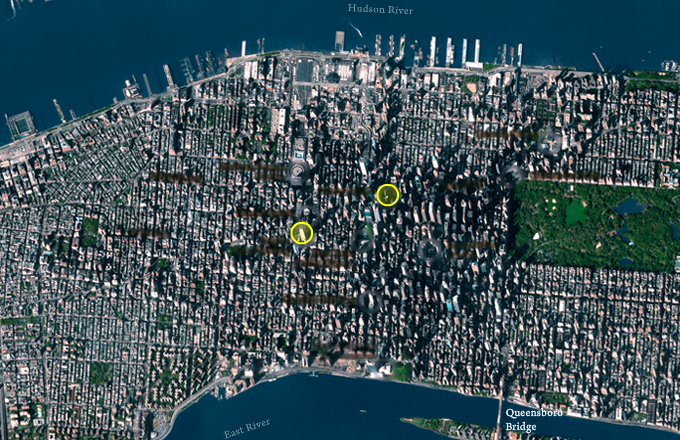 The older shoreline strikingly engages one’s mental map of Manhattan’s shore. It jar one’s notion of place, and shift the stability of shorelines, streets, and riverine banks within one’s head. 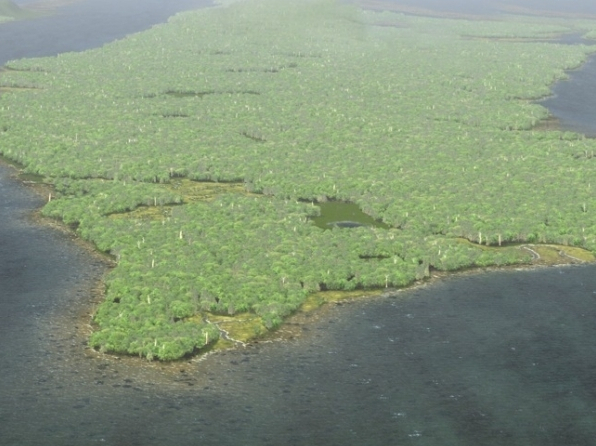 Superimposing data from a Google map visualization of the verdant forests, ponds, streams, and marshes before four centuries of landfill shrunk its coastal geography, the map reveals a huge change in place in a powerfully persuasive graphic form. 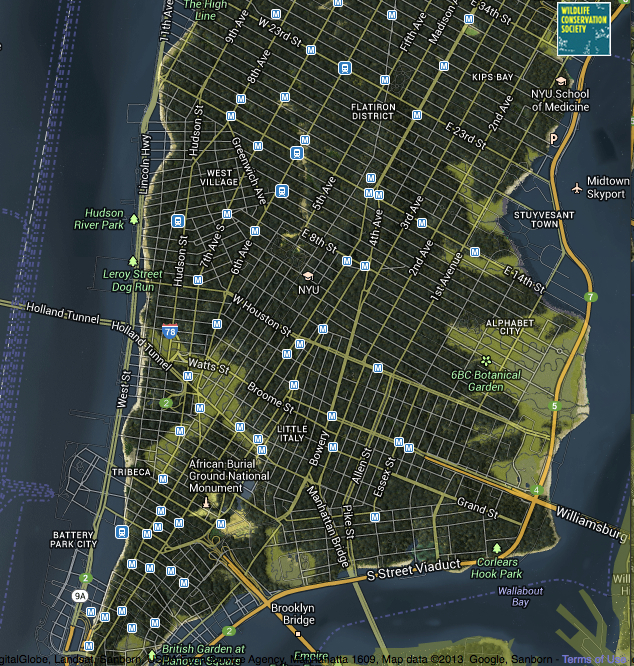 Indeed, the superimposition of the shifted maps–the street grid and coastal drives laid above the earlier contours of the island’s expanse– is compelling by the complex cognitive dissonance it creates, placing multi-lane expressways and drives on the expanded edges of the island, so that they run across the marshland estuaries of the Lower East Side or cut into the blue waters around the island, suggesting the actual de-naturing of the landscape even more than the de-naturing of place that all Google Mapping templates seem to afford–and far more eerily reminding us of the extent to which we’ve effectively distanced ourselves from the expanse that the island once occupied as well as the ecosystems that it held. These now absent beaches, marshlands, and estuaries in the landscape offer a striking contrast to the current shore. 4. Maps offer persuasive forms to re-think cities’ relations to oceanic shores, perhaps more compellingly altering deeply set attitudes than new practices of planning to integrate more fluidly and esthetically water and land. Although Beatley calls, at http://www.biophiliccities.org, for new attitudes to the surrounding world, and fostering a new culture of lifestyle, curiosity, and an integration of the tactile presence of the seas in “blue urbanism,” we might better appreciate the nature of the frontier created between city and water not only in the benefits of immersive aquatic environments in cities, but respond to the absence even of registering seas in urban planning by examining how we came to map a disconnect between cities and ocean– and the cultural divide that has emerged between shore and urban space that was elaborated from the mid-nineteenth century, and is now deeply established by zoning, districting, EPA standards and urban planning texts. In asking to extend our concepts of cities to the oceans that surround them, we might work not only to make new maps, but use old maps to be mindful of the need to extend our sense of place through the refiguration of urban spaces–noting how maps mark and register the depths of the cultural divide between urban and oceanic space, and examining maps to chart the losses of a shifting historical relation between the city and ocean. Such a remapping of the city’s relation to the land is echoed in the recent interactive mapping project of Stamen Design, Surging Seas, which tracks rising sea-levels caused by storms or flash-floods, mapping sea levels in relation to the inhabited land–and visualizing a nine foot rise in sea-level of nine feet, here in lower Manhattan, based on data from Climate Central. 5. At a recent discussion in San Francisco’s Exploratorium about relations between land and sea promoting such a “Blue Urbanism,” the relations between place and global change rightfully gained considerable attention. 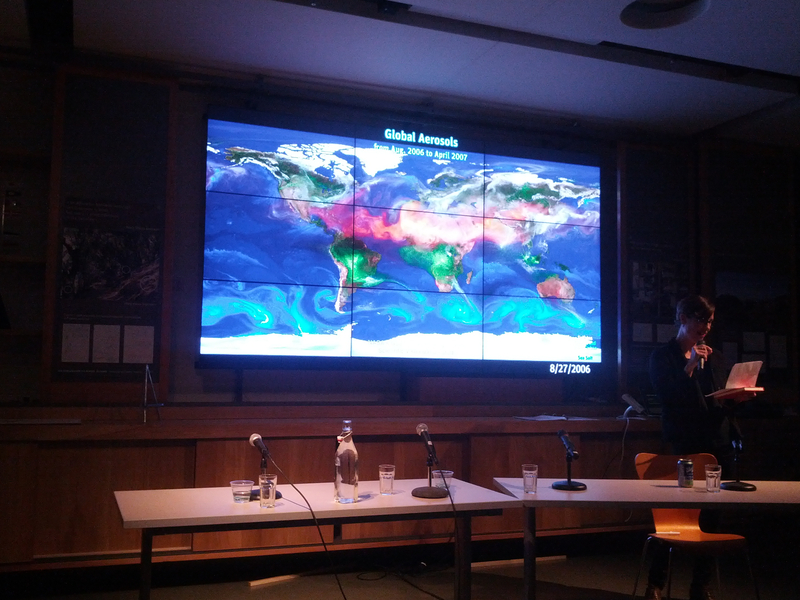 Most presentations focussed on specific examples of cities, but the problem was pressingly (and depressingly) relevant given the recent typhoon. Occurring in a room exhibiting such splendid shifting nine-panel global color video projections, courtesy NASA’s LandSat satellite photographs or the Goddard Flight Center, of Global Precipitation Levels, Sea Surface Currents and Temperatures, Ocean Currents, or, below, Global Aerosols, they seemed to provide a unique context for rethinking the presence of the local in relation to the sea. For only in rethinking built relations between land and sea, and the compartmentalization that led to the diffusion of aerosols, the shifting of water temperatures, and changes in the level and salinity of oceans over the past one hundred years, can we measure the human footprints already left on environment. 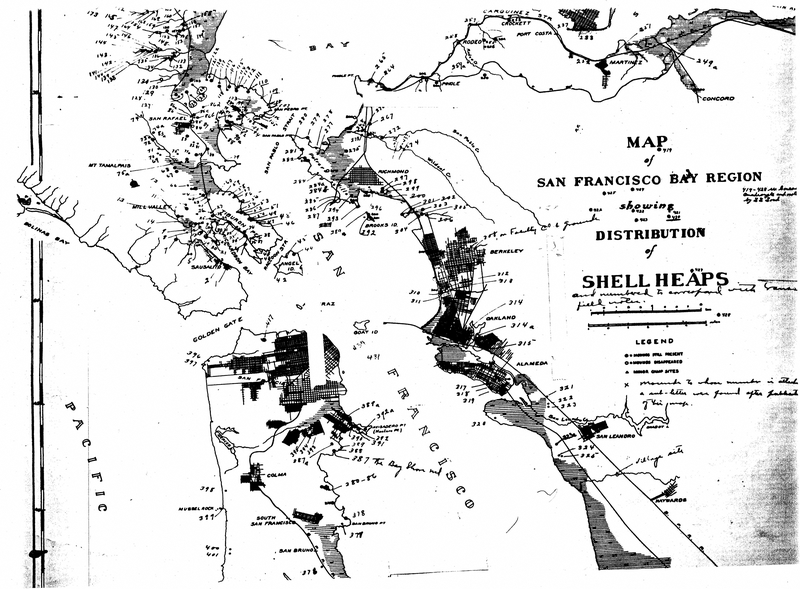 One such remapping of such relations and attitudes might begin from maps, it began to appear–and from the inspiration maps might provide to remap relation around San Francisco, not only by seeing how space was filled by the city–or the urban conquest of space–but rather how the negotiation of the boundary with the sea was based on spatial practices of such longstanding nature, entailing and perhaps rooted in the representational practices of defining space as an area of settlement and urban planning–and a practice of planning that sees space as filled up by housing projects that cut off the marine space of the sea. The projected maps on plasma screens raised questions of how to rethink the sedimentation of such deeply set cultural practices, if only by providing a context for the dramatic remapping of urban environments at a remove from the ocean’s ebb and flow–or relate place to a far broader context of environmental change. When Rebecca Solnit recently offered a haunting analogy between global warming to the processes of gentrification that threaten the fabrics of urban neighborhoods–both occurring with blinders to the overall structure and coherence ecosystems, whether the social ecosystem of urban space or global ecologies, and of removing oneself from our role in creating a scenario of global warming or urban change. 6. The history of spatiality and of spatial practices that define the city may suffer, one soon realized, from the separation of such “spatial practices” from an appreciation of urban environments. 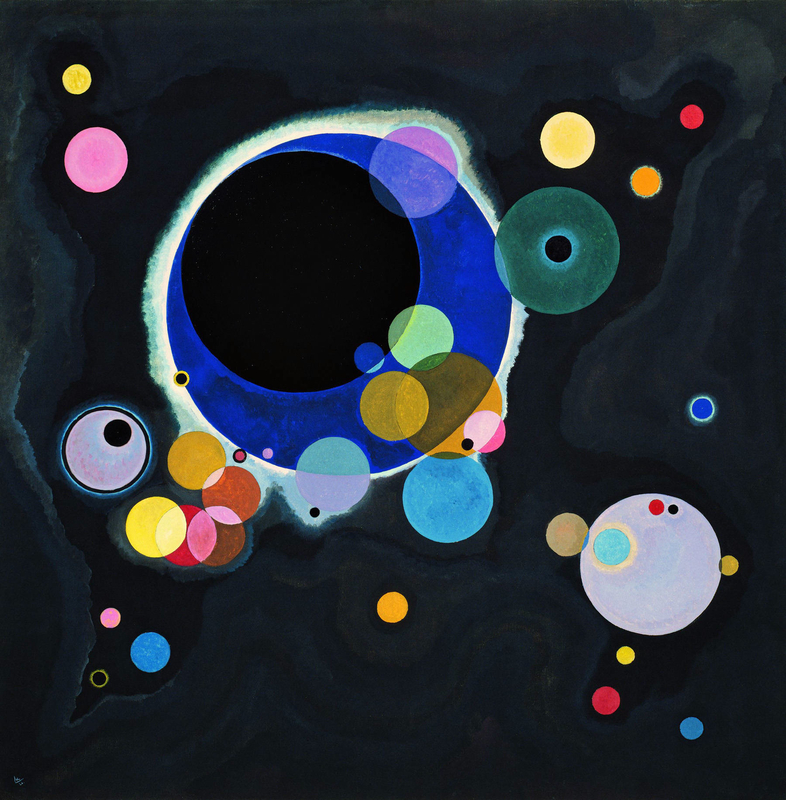 The circumscription of the spatial is partly inherited from the conceptually pioneering–if idealizing– strain of thought in the work of the French sociologist Henri Lefebvre, whose notion of in The Production of Space was rooted in an Aristotelian or Kantian categorization of space as a human creation. For when Lefebvre distinguished forms of apprehension among social practices, representations of space, and symbolic models of spatial representation, he refined how Aristotle cast position as a category of human apprehension and Kant affirmed space as an attribute of human judgement–rather than an ecological space of multiple species’ interaction, or indeed of biological overlap. Instead of commodifying space from a human point of view, we fail to register either local specificity or the density of coexistence around place: maps can return attention to all too often forgotten margins of settlements, and effectively reconstitute place in a greater environment. A similarly broad sense of the sea-shore as a “primeval meeting place of the elements of earth and water, a place of compromise and conflict and eternal change,” as much as opposition, was suggested by Rachel Carson, who suggested the basis for understanding the shorelines by “the long rhythms of earth and sea that sculptured its land forms and produced the rock and sand of which it is composed”–and the biological communities specific to each. 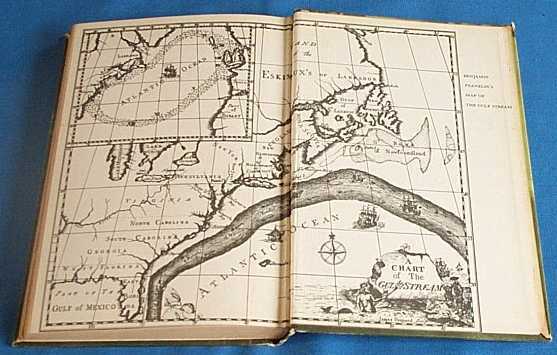 She chose a map of the Gulf Stream as a sort of emblem for the situated knowledge of the shore, using a version of the 1769 chart of Benjamin Franklin based on the working knowledge of a Nantucket sailor, Timothy Folger, that is the end-paper for her 1950 The Sea Around Us; Carson praised the map for transmitting understanding of ocean currents–and for the first time locating the course of the equatorial Gulf Stream, or “Gulph Stream,” on a map, in ways that embodied a tacit familiarity with the flow that many sailors well knew, but which Franklin, as Postmaster General, was frustrated to find absent from any chart. The recovery of the rare original Franklin-Folger map showed a pointedly less centrally defined Gulf Stream than the composite map reprinted above, but illuminated a new need for mapping oceanic expanse–in this case, for the postmaster general to elucidate the greater time needed to traverse the Atlantic from England, which world maps or charts had long excluded, in failing–or, more accurately, not knowing how–to map the seas. 7. 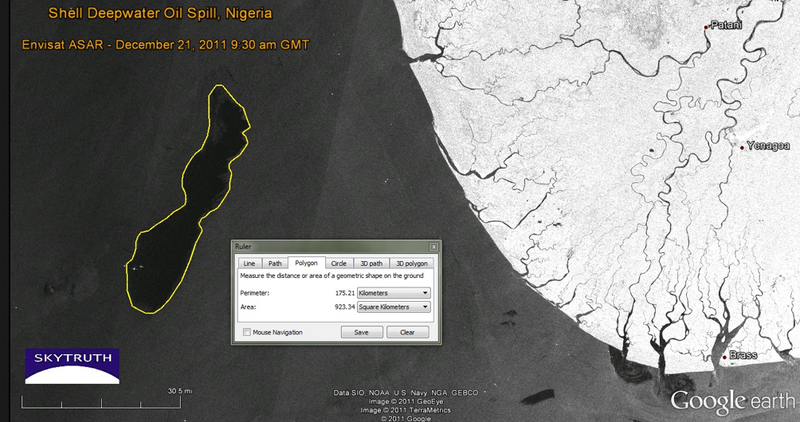 The question then becomes how to adequately map the seas, as much as urban space. 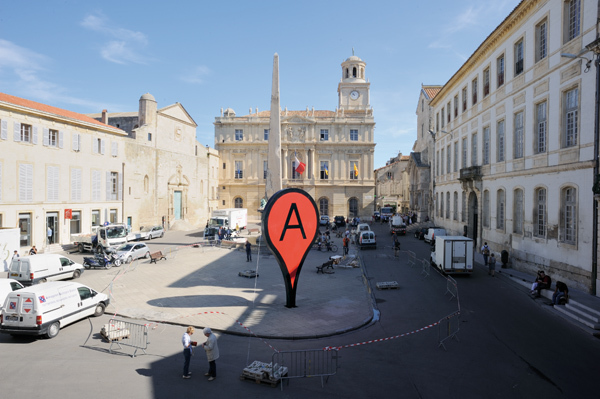 The ability to register and communicate familiarity with place–and with a watery space–is particularly lacking in most urban maps. The absence is a considerable difficulty for adequately registering knowledge of the sea on its own terms, or the shoreline and its inhabitants. 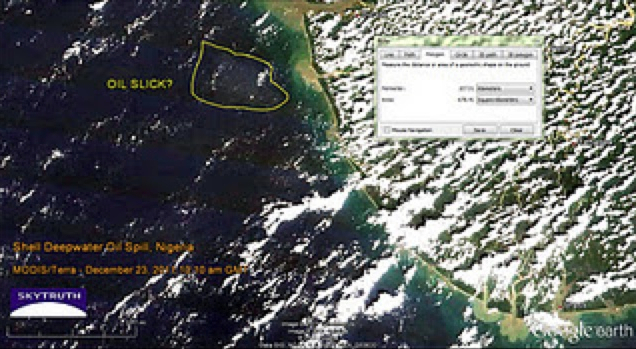 Or can we use maps to register a shifting knowledge of the ocean’s shore? One charge for spatial history would be to excavate the construction of space in different environmental contexts. If it is to extend beyond the recapitulation of space as a human construction, “space” might be more adequately placed in a global–and less of a human–context by recognizing and affirming space as an ecological category. 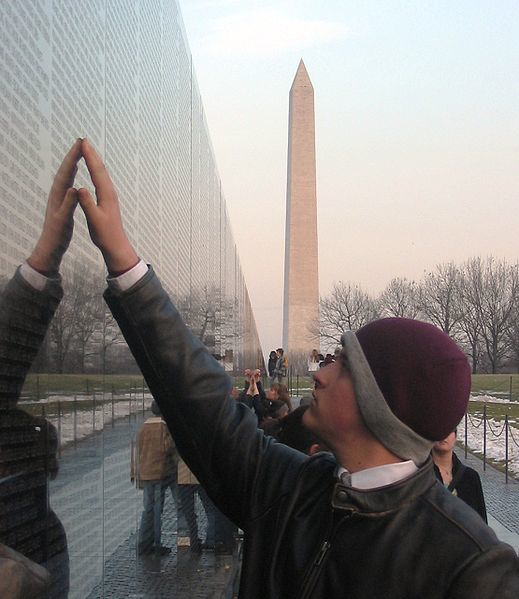 One place to start would include the negotiation of deeply set cultural categories of division and differentiation that are framed in maps, taking the map as a human artifact–rather than a representation or a practice, a model of interaction that conditioned and provides evidence of lived experienced. For the tendency to idealize space at an Apollonian remove–an image perpetuated, to be sure, in maps which subject the cognition of space to human understanding–abstracts space as a category of apprehension, rather than registering the density of interaction through a suitably “thick mapping” across boundaries, borders, and regional change that recuperate buffer zones, watersheds, and shorelines we have lost–in ways the art of mapping is uniquely suited to portray. 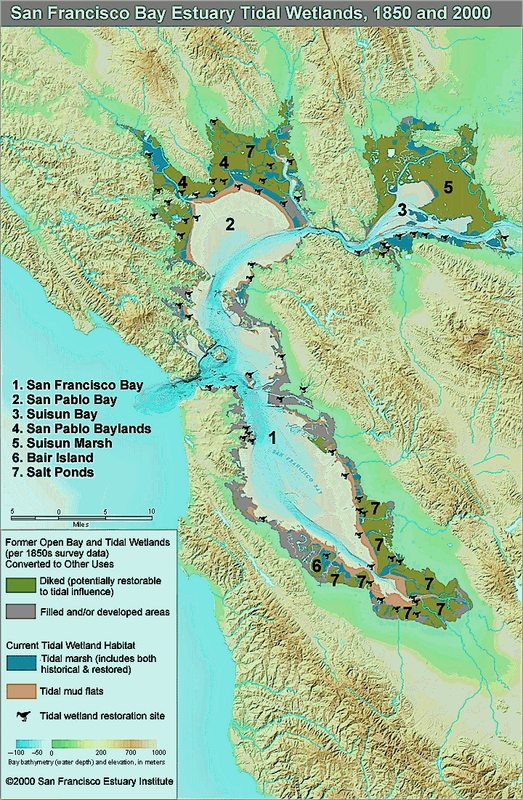 The challenge of recuperating the network of estuaries and streams that once surrounded the low-lying areas around the San Francisco Bay, for example, might negotiate with how we constitute the terrain for urban life by drawing a clear divide from the surrounding waters–or the perpetuation of the fantasy of drawing a clearly demarcated line dividing water and land. 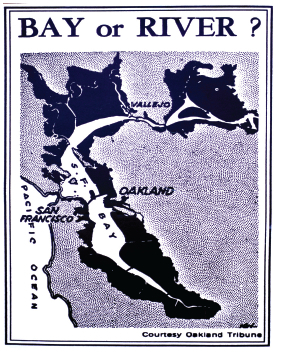 Rising seas once flooded a river valley to create San Francisco Bay, whose many inhabitants long existed in relation to a less clearly defined shore. 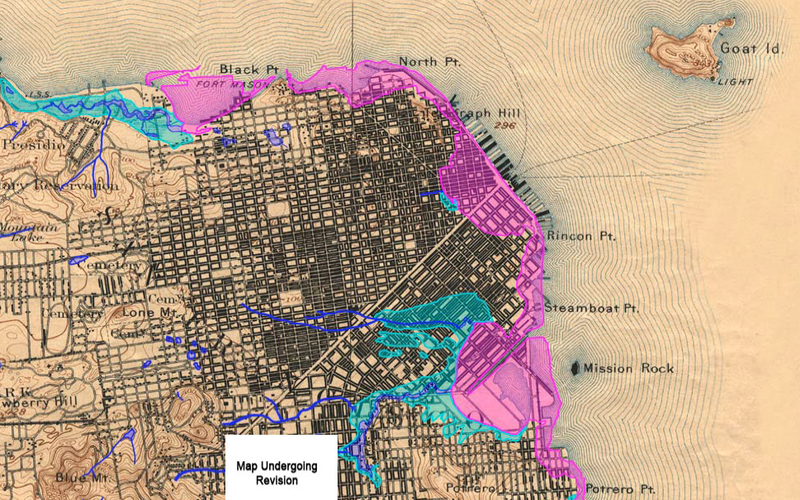 Maps can reveal how humans have interacted with the Bay over time that created deep mental barriers to interaction. One can trace the shoreline moving in hundreds of feet inland, and slowing in past centuries to but a millimeter a year, or a city block over the last century, as a shape-shifting feature with which bay residents have negotiated in different ways since a time when people lived near the bay, and negotiated with its salty marshlands, as a map of native American Shell Heaps that ring the bay eloquently reveals by noting the clear buffer zones that inhabitants created on beaches to meet rising tides. 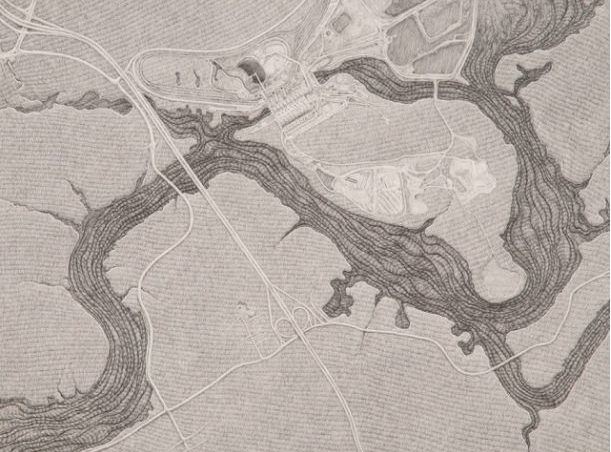 The maps registers crucial details of the negotiation with marshlands and wetlands now lost or recently restored, outlining an image of interaction with the sea that is not immediately recognizable, and difficult to negotiate with our own changed landscape. The particular coastal region near El Cerrito indicates the building up of these mounds to create a permeable barrier from the resident crustaceans along the marshlands running from north of Albany Hill to behind Point Isabel–now landfill, then a remote rock in the Bay. Yet as people moved inland from an 1850 shoreline was reduced by almost a third all of a sudden in last fifty years in a quite rapid and decisive manner, to create a new sense of the stability of the shoreline that segregated land and sea which will be particularly challenging now with the rise of sea levels projected global warming. 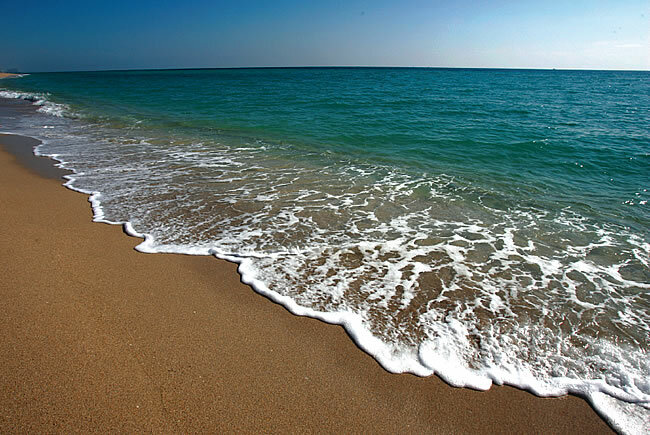 The illusory stability of the shoreline is however inevitable . 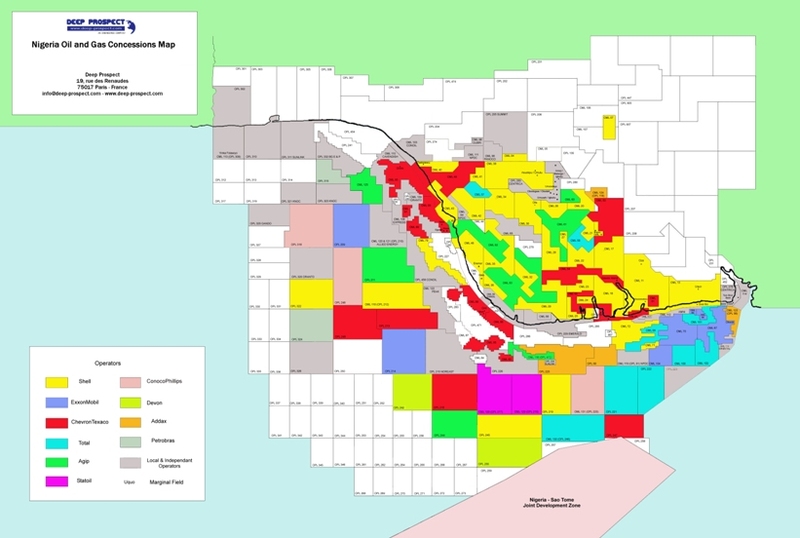 . . and the bay on track to expand again by 2100, to return to its size of 1850, in ways that pose disastrous consequences for such overbuilt regions of low elevations. All low-lying areas are threatened by this projected expansion of the ocean, from Foster City to the treatment plants near to the Bay, to Oakland and San Francisco’s low-lying airports . . . and Oakland’s port. In cities with waste facilities, oil tanks, refineries, ports and airports lie close to the water, as in Richmond, Oakland, the Carquinez Strait and Albany, ocean waters pose very real environmental threats illustrated by the tsunami’s breaching of the Fukushima Daini power plant. 8. Can we redesign the shoreline differently? 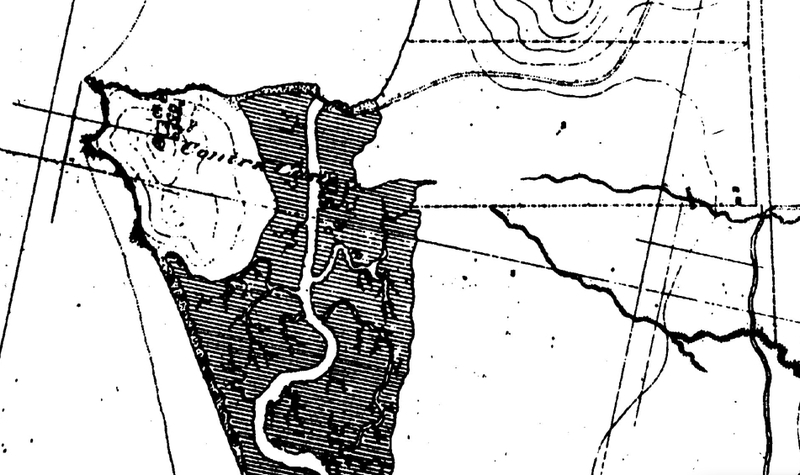 Observing these low-lying areas that stand in close relation to the water in this map of 1850, we might consider the importance of beaches that can constitute a natural buffer to the shore, and the need for restoring their role as transitional zones and regions that has been so precipitously eroded in our environment. For the erosion of such transitional spaces–and the overbuilding of the shores–has rendered more vulnerable low-lying areas such as Albany, Emeryville, Oakland or El Cerrito, encouraging blinders about the potential possibilities of future risk. Will the process of getting to know the shoreline again provide a way to make them stable barriers once again? Will we be able to provide natural resources by fluvial deltas, and support the growth of these buffer zones to do better on a second chance, by expanding an estuary system linking to the ocean that was so drastically mis-designed in the 1950s, when it was even proposed–if the proposal was reversed–to pour more landfill into the Bay, and re-zone the estuary, in order to fill an expanding housing market? 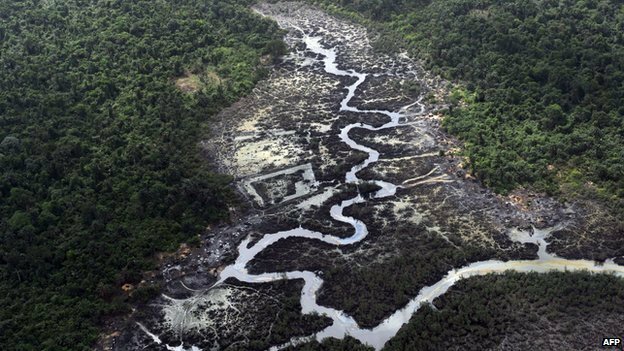 The map cannot begin to conjure the shifting dynamic within the landscape and ecosystem we have lost–although the system of dykes and landfill suggests the beginning of the possible excavations of a lost shoreline. 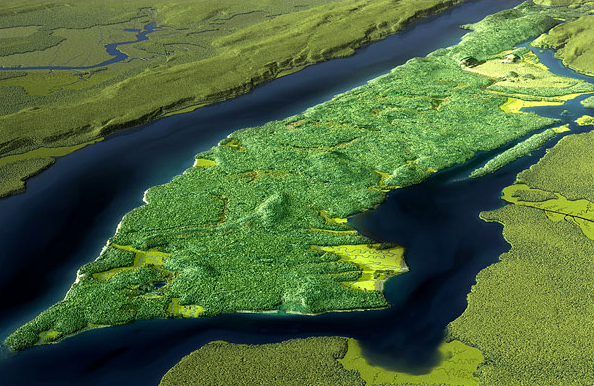 This image of the expansion of the city’s urban claims to housing derives from a cultural and deeply anti-ecological view of the city as a site of stability–and ocean was seen as a site of antagonism on which, in the domesticated image of the bay, the city could rightfully expand–and the estuary be recast as a river to accommodate housing needs. In starting to change our attitudes to our shorelines, and to view them as sites for other residents and as permeable barriers, we might start from changing our attitudes to the sea: and remember, with Rachel Carson, that it is through our expansion of the “artificial” nature of cities that we have forgotten and somewhat brazenly rewritten our relation to the shoreline and the sea. 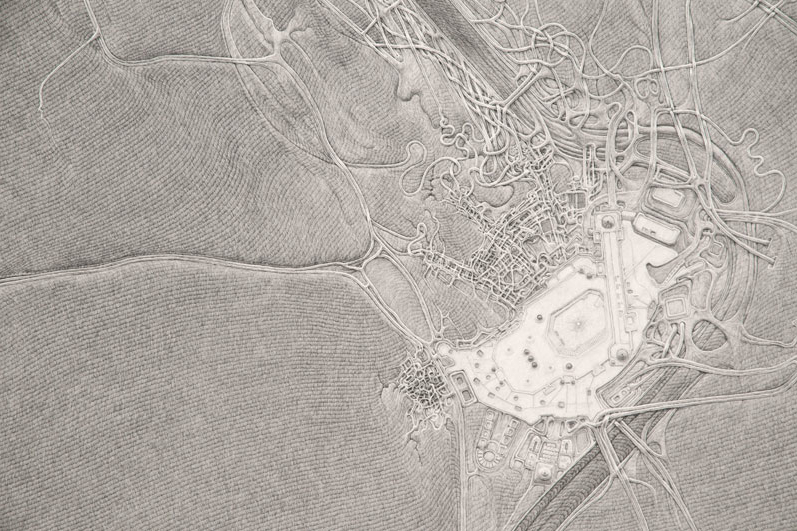 Maps, of course, forge bridges between nature and culture in provocatively engaging ways–and engage viewers by mapping these relationships. 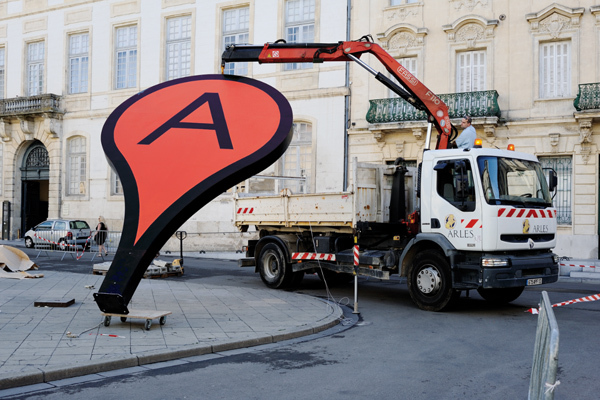 If we are starting to remap place in provocatively interactive ways, the challenge is to best map the shifting relation between place and the global changes that call for an extensive remapping of place within the world. The late, great outlaw historian of cartography, J. 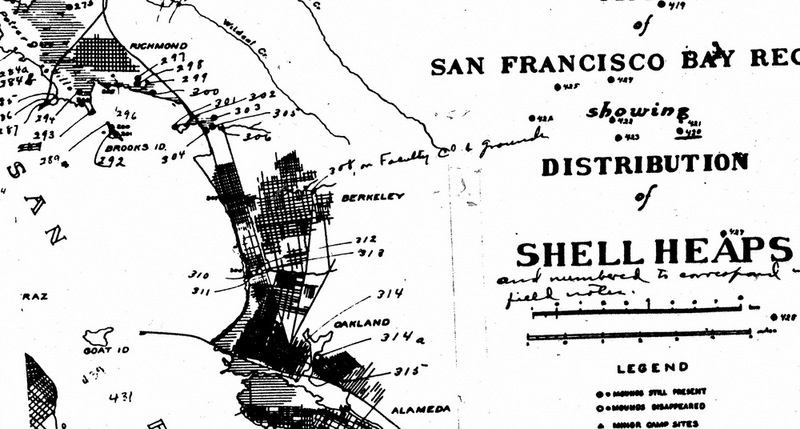 B. Jackson, founder of Landscape and a Lone Ranger of the Berkeley hills, argued that the geography of the freeway was a dominant but rarely appreciated subject of academic study. For Jackson argued that despite much study of maps and topography, cars coursing through space provided a new experience of space itself, and one that was poised to become the dominant way we experience the landscape. Contrasting the space of the highway to the space of Mexica adobes, Jackson believed he identified the problem of writing about the experience of national space in the twentieth century, explored in a series of essays on the shifting perception of geography and highways, and the mapping of the new settlement of space. 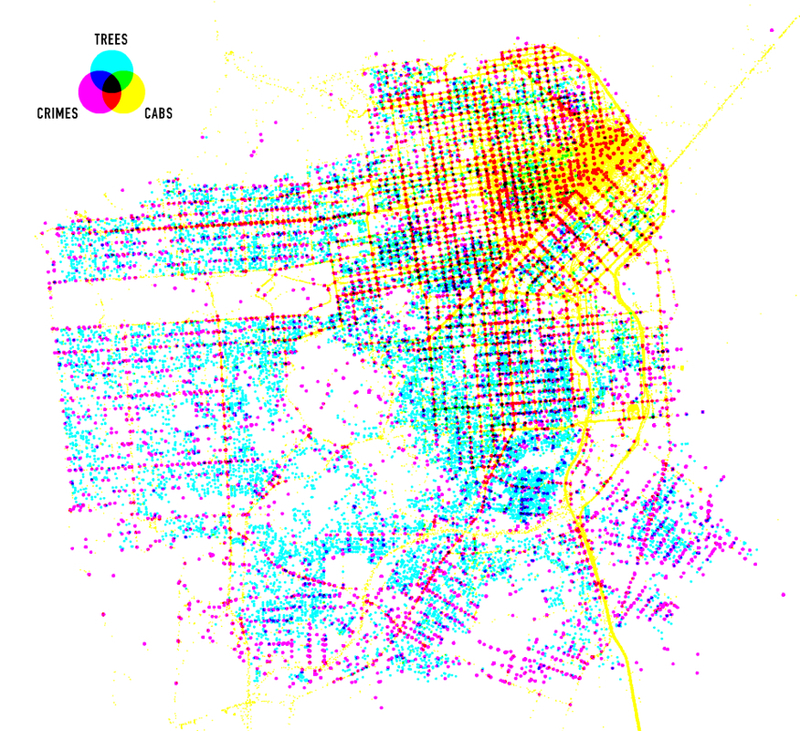 Rebecca Solnit published a lovely article that might be seen as an expansion of some of Jackson’s points, but which takes a map as emblematic of the ways that commute routes suggest the dangers of such a shifting of the inhabitation of San Francisco’s public space. 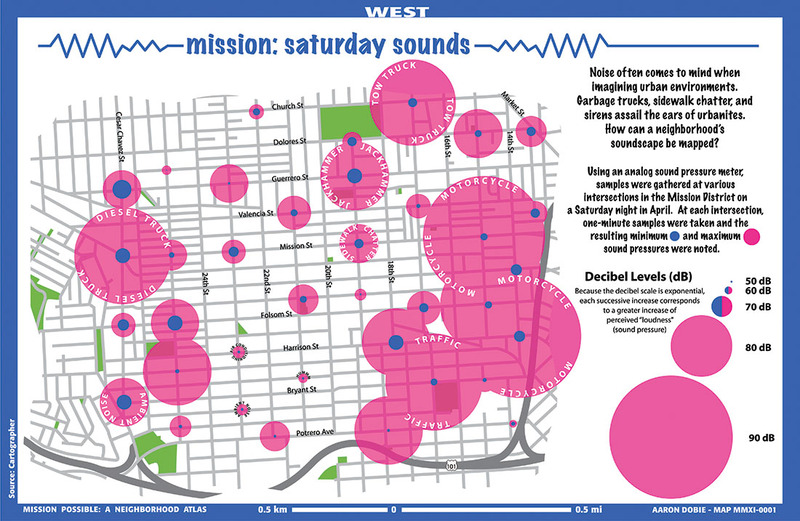 For Solnit, the 2012 map that has been called “The City from the Valley” reflects the precipitous housing market of San Francisco as it makes evident the “invisible” network of a series of unmarked bus stops that ferry workers not to freedom, but to work. The maps mark what Solnit describes as the arrival of “Google Invaders” in the city, and she sees it as concretizing the menace that an influx of new cash from Silicon Valley workers that has flooded the San Francisco real estate market, and effectively placing many of its current residents–focussing on the artists who have made the city their own–not only at a disadvantage, but as the apartments were they lived become targets of eviction. As apartment buildings they lived in are converted from rental units to feed the insatiable demand for housing, the rising market prices of housing are met by an audience which uses a separate transit system–and renders unoriginal whatever organic community and economy Jane Jacobs saw as the basis for the American city. 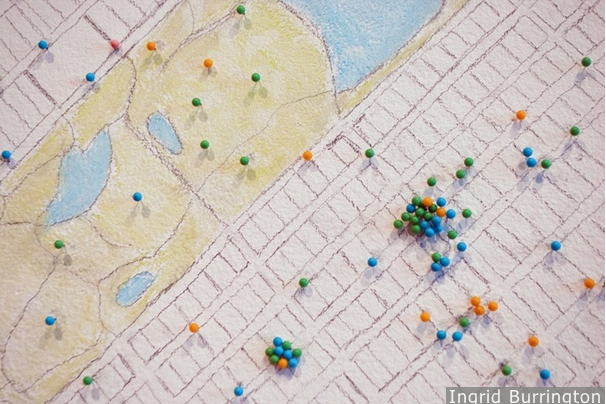 Solnit has recently immersed herself in the problems of mapping San Francisco, and her piece brings together some of the familiarity with San Francisco as a residential city with an eery foreboding that San Francisco has come to symbolize a lifestyle with appeal among a breed of commuters to behemoths of Silicon Valley, who she characterizes as faceless sorts, ferried by dark-windowed private buses operated by each employer, as if Storm Troopers in suits. The possibility of buying real estate in this city faces a squeeze generated by hugely wealthy potential residents who work outside the city, contribute minimally to its quality of life, and rely on corporate subsidized commuter buses that undermine the prospect of public transportation–and adopt a new means to use the urban infrastructure for tech workers to travel to their jobs in Silicon Valley not sharing revenues with the city. Solnit included with her complex and more multi-faceted argument is captured a single map of the new private transport routes that have been introduced, as a shadow system of urban transit, by Google, Apple, and EBay: Geoffrey A. Fowler crowed that “A San Francisco design firm has literally drawn a map showing how the city and Silicon Valley are growing closer together through a network of private corporate buses” in The Wall Street Journal, heralding the growth of a new archipelago insulated by new commute routes that linked monied preserves. 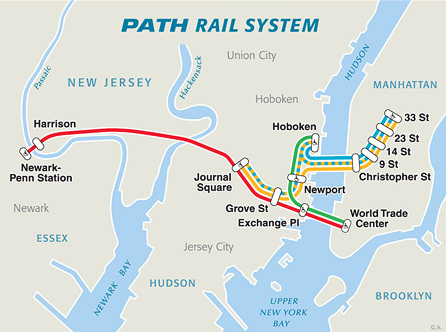 Calling the network “the future of transit,” the routes are designated for corporate workers, rather than urban residents, and ferries them along special corridors from residences to places of work, severing connections to the places where they live without using municipal transport or brining benefits through local highway tolls. The transit system that serves this new population of inhabitants working in the Valley reveals a sort of parallel existence of a financial network that has vampyrically sucked or absorbed the housing market, and daily moves to work at a remove from the city’s space on multiple peninsula shuttles whose opaque windows move folks to their work away from home, and funnel every increasing salaries into the housing market: or, to reverse metaphors, the map that shows movement to and from the Valley might be seen as mapping not only the routes of busses that were not known publicly before the publication might be taken as emblematic of the influx of Silicon Valley money that increasingly feeds San Francisco’s population. 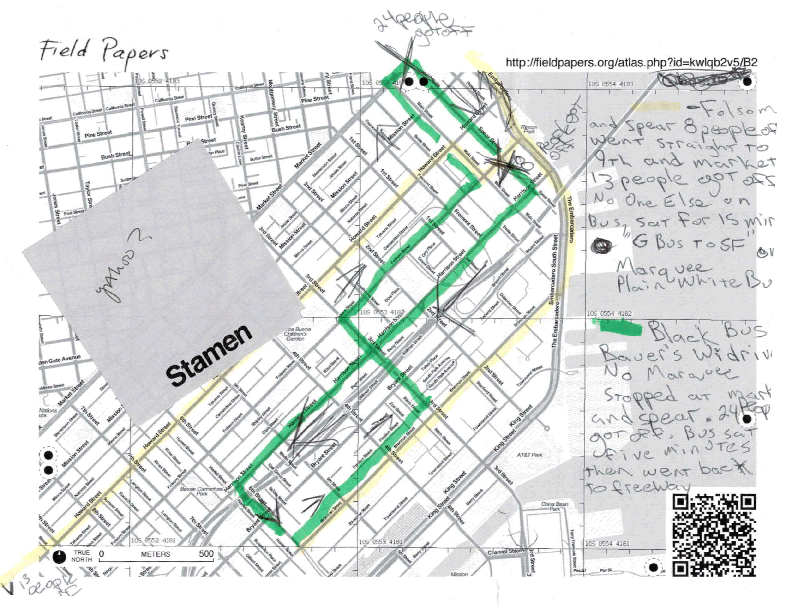 While such lines are private, and the sites of stops secret, the Stamen group used Field Papers to do an ethnographic mapping of private bus routes based on first-hand observation in order to create an alternate “atlas” from data traced by hand, and then scanned back and retraced in GIS systems like QGIS or OpenStreetMap. 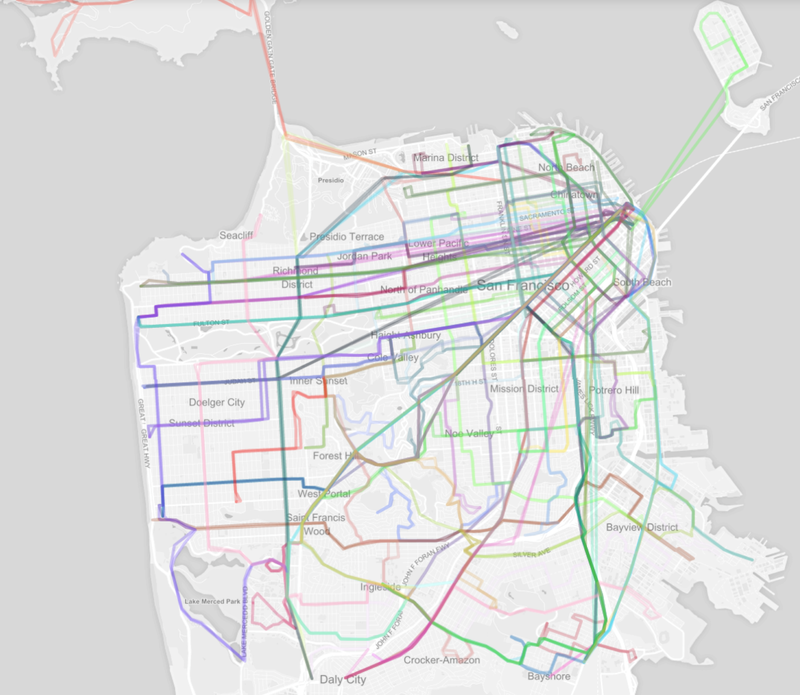 The result is to publish the shadow routes that the private bus lines use to ferry workers from San Francisco to Silicon Valley. Its designers devised the routes that these large busses with wifi and dark glass windows take to provide an elite mode of conveyance to work to contrast it to the existing transportation networks that serve the city, based on careful observations and plotting of such private bus routes based on close observations of the pathways that the buses actually take, using Field Notes to sketch the routes then assembled into a synthetic coherent system. And they have called it “The City and The Valley” to highlight the unique relation of a city where residents increasingly go to the suburbs to work, and money from the Valley enters the city to inflate its astronomically ascendant rents. 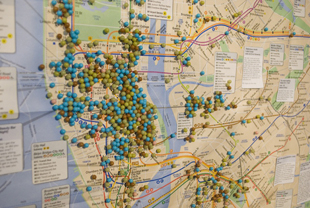 By plotting and publishing a rendering of the network of private busses against an OpenStreetMaps base-map, the exclusive commuter system could be charted in winking reference to a famous public transit system–Massimo Vignelli’s 1972 MTA map of the New York Subway, whose comprehensive Graphics Standard Manual invested something like modernity to the public transit system of New York City–that highlighted the exclusive clientele that the buses were created to attract, but imagining one would be able to similarly move between their lines in a nice conceit. 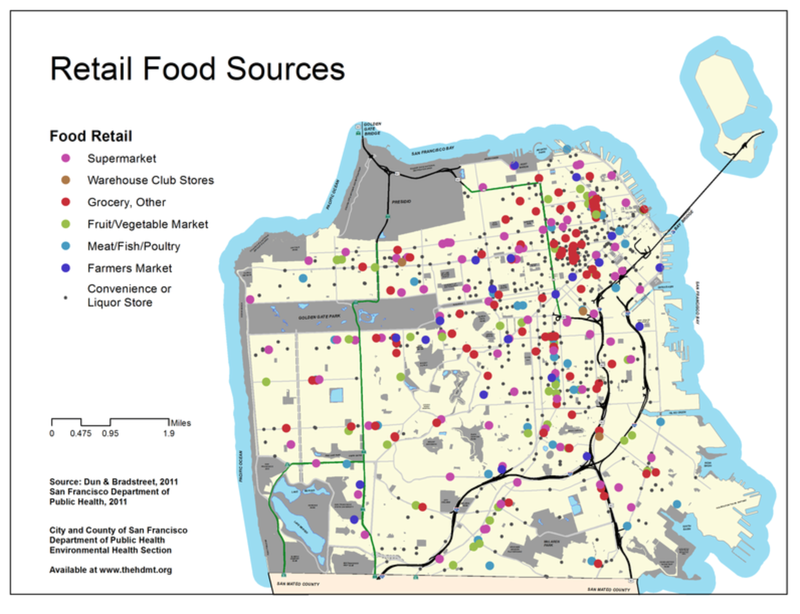 The map provides a basis to define the corridors of transit for those who are looking where to buy their houses that will guarantee access to the restaurants, theater, clubs, cafes or aura of their new chosen city of residence, San Francisco, in which they have arrive, and was indeed drafted by a small design firm most of whose workers live in the Mission–and have seen the busses rather than ever taken them. 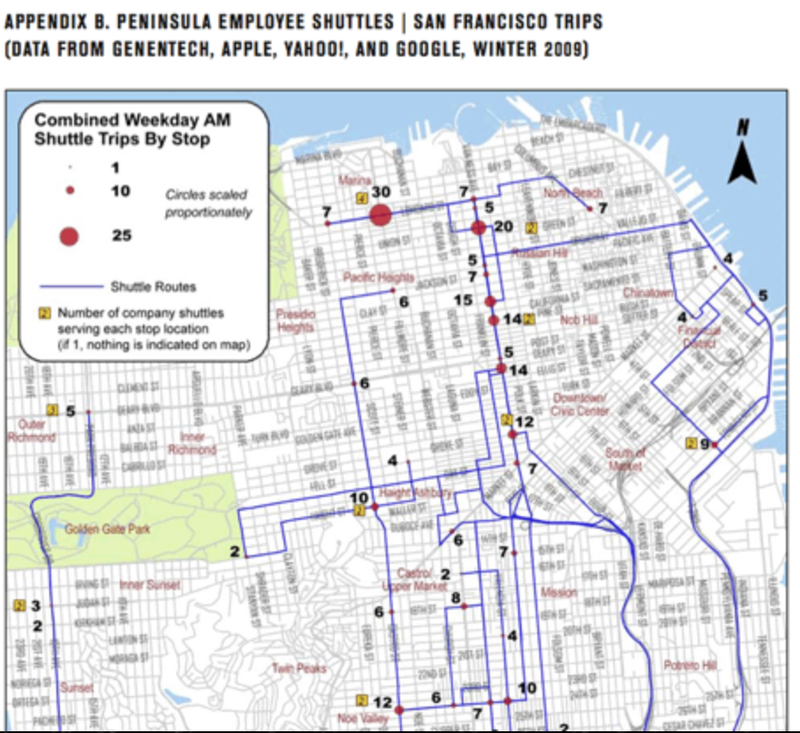 Solnit argues that the network of private busses effectively created a snare for its current inhabitants by forcing up real estate prices to unreasonable rates: the map addresses those bus riders who work for Google, Ebay, Facebook, Apple, Yahoo and Electronic Arts, and has itself already even been used by over-eager developers in Bernal Heights to show the convenience of location to these corporate buses, and promote the ease of access to private bus lines that their neighborhood allows. The adoption of iconography from the familiar image of its public transport, the Bay Area Rapid Transit system, is telling. Urban routes of transportation are mapped but dwarfed by the major corridors of the bright yellow stream of Google commuters,––– overflowing the commute from Lombard and Filmore to Van Ness, accompanied by a strong bright blue line of Apple workers. 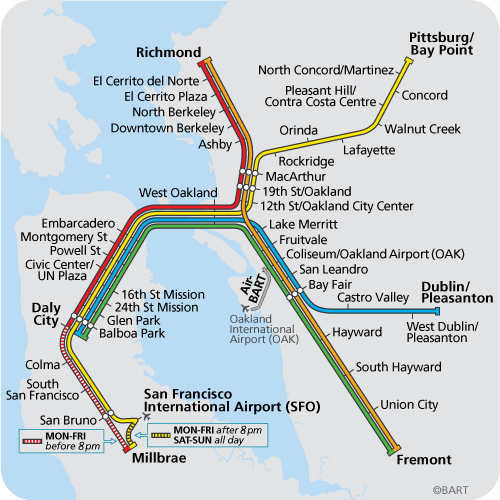 The colors reference the Vignelli map, but also seem to replace or revise the familiar image of BART routes, while appropriating the schema of primary colors that designate the Colma, Richmond, Pittsburg/Bay Point, Dublin/Pleasanton and Fremont routes. 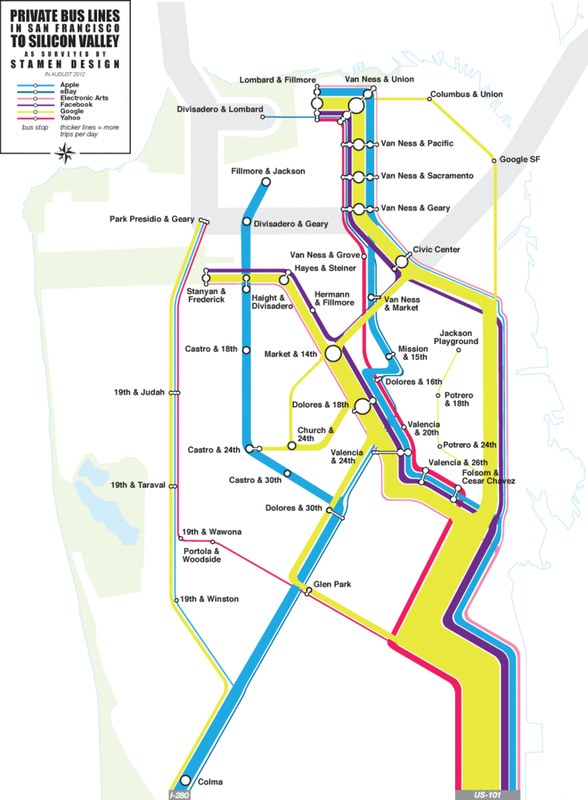 The subtle shifting of colors from the solid green, red, orange, yellow, and deep blue of BART lines seems undeniable: the day glo colors of the Private Bus Lines map are both more hip, squeaky clean and somehow more oblivious to their urban surroundings. Jackson theorized freeway views created a relation to space that deserved to be acknowledged, and called for buildings to respond to its landscape. The darkened windows of private buses obliterate any relation to the landscape serve as pods that ferry highly paid workers from home to work, so that they needn’t be harried by the urban space that ostensibly surrounds them. They are less interested in a relation to space, or the navigation of lived space, than the preparation of a speedy route of commute.